(Wenham MA) I should have learned my lesson. Points are going to be scored in bunches. 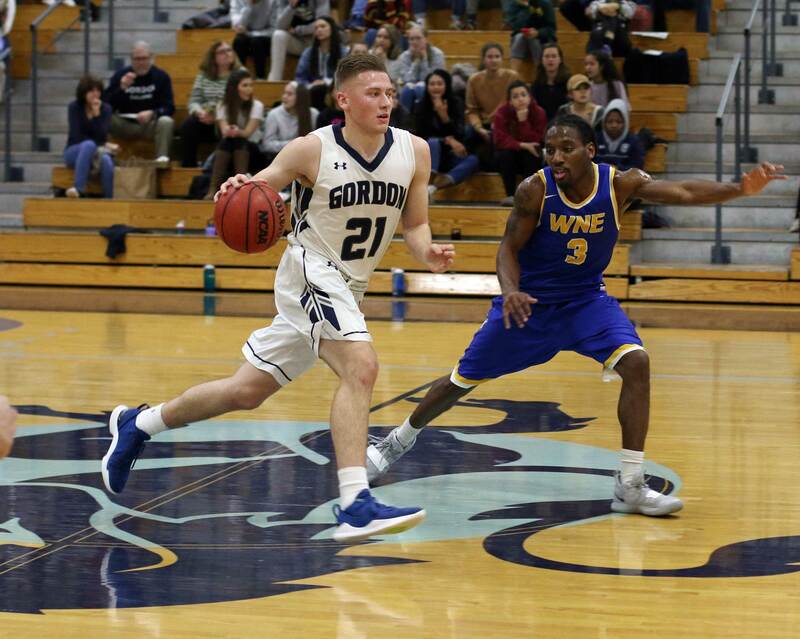 Gordon (6-1) rode a 58-point second half to a, 99-70, Commonwealth Coast Conference win over Western New England (2-6) on Tuesday night at the Bennett Center. Anyone in the building will tell you that the final score was very misleading. This was a 3-point game (41-38) at halftime. Gordon had dominated the first part of the half and the Bears the other part. 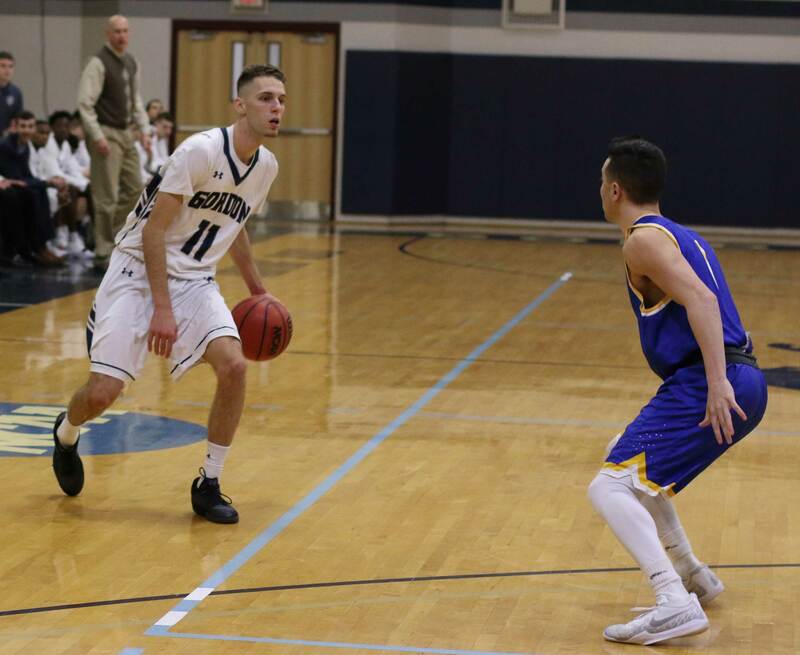 “The beginning of the game we were killing it,” explained senior Noah Szilagyi afterwards. Seven minutes in the score was 17-2 but WN was too good a team to let that last. Suddenly the visitors began to drain three’s and that lead evaporated. 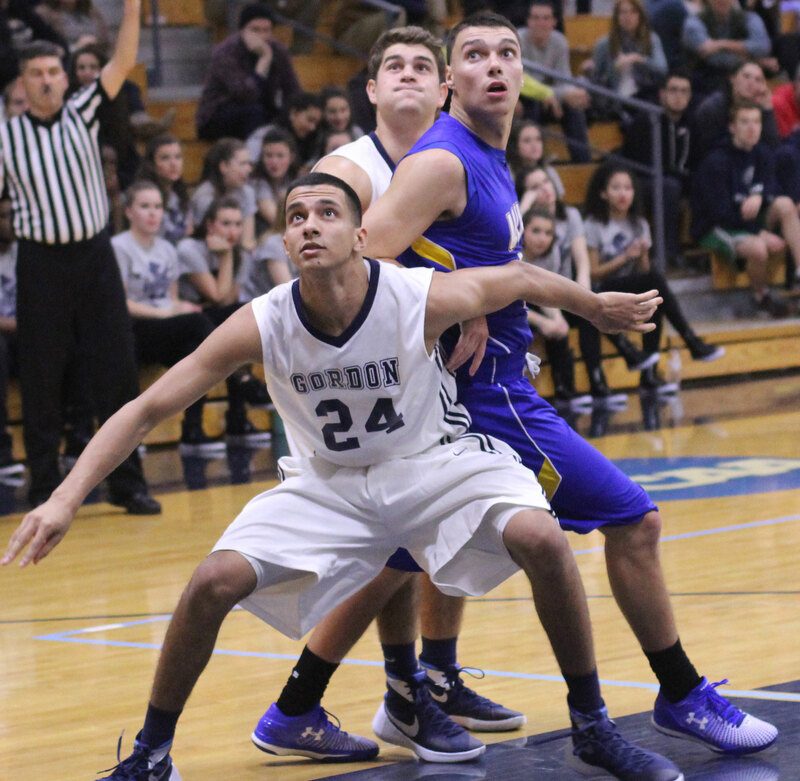 “We gave up open three’s and against any of the teams we play, they will knock them down,” said GC coach Tod Murphy. Things changed in the second half. 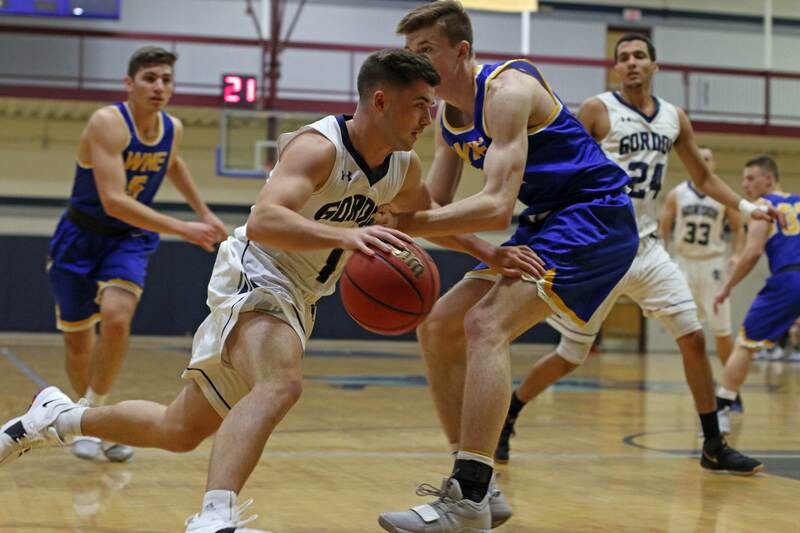 Gordon’s rediscovered ability to defend the three and discourage layups put Western New England in a bad way in the second half. 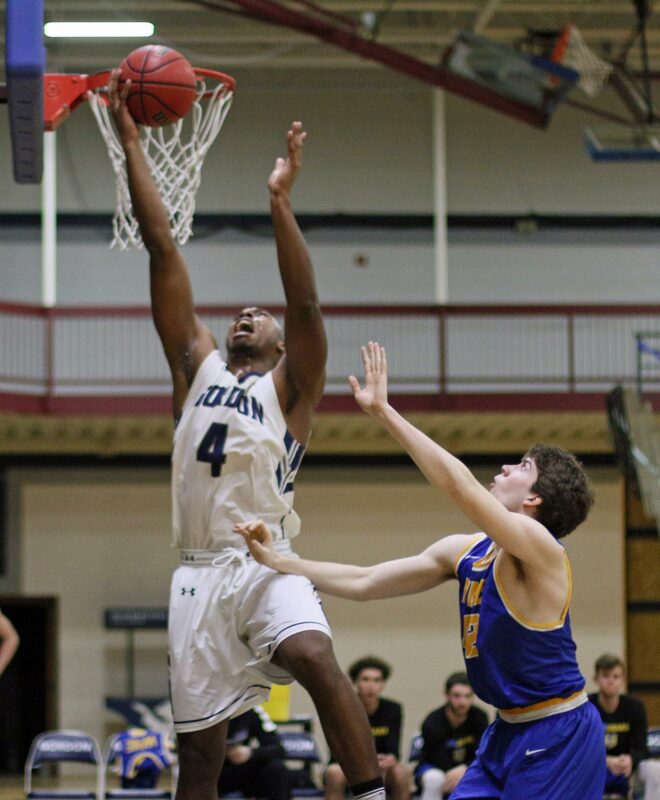 Taking the biggest hit was the Bears best player, Mikey Pettway, who entered the game as the CCC’s top scorer (25 points per game) and left Wenham with a 3-for-10 night and six points. 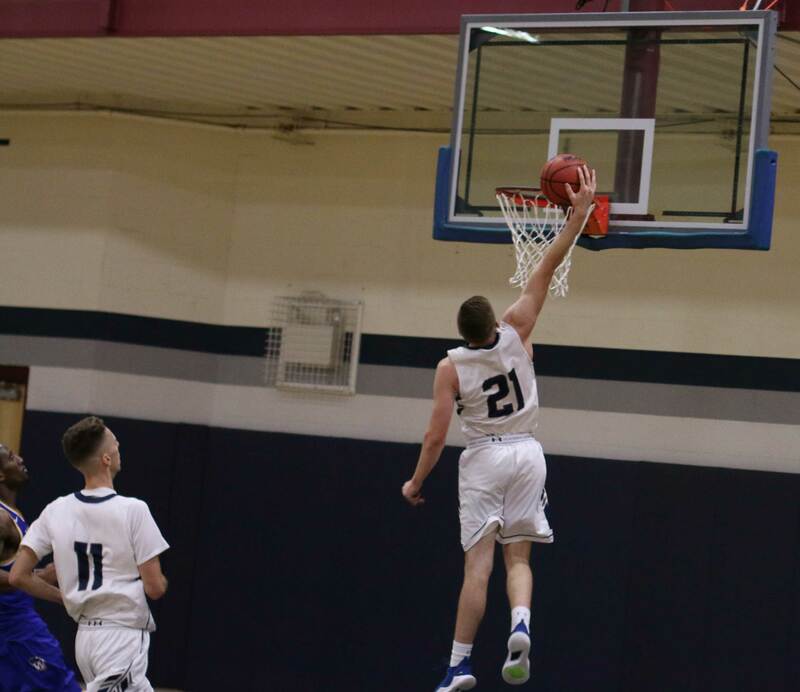 Recall that in the first half the Scots jumped off to a 17-2 start. Second half they did better! The halftime 41-38 tight game turned into 58-38 five minutes into the second half. That’s a 17-0 run. The Bears missed their first ten shots. And that was what they did. The spread rose into the 30’s and before it was over, thirteen Scots had scored. It’s already been a “good” season; a 6-1 record, including three wins in the conference, and a five-game win streak. Plenty of excitement in the house, as both Garrisson Duvivier and Eric Demers were honored for reaching 1000 points last season. Both continue to add to their career totals. 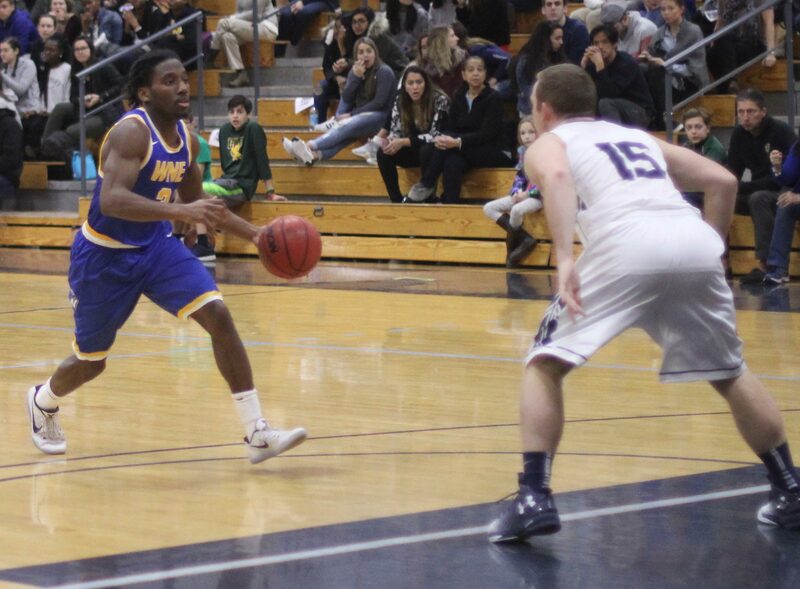 Eric (1190 points) passed Joe Witherspoon and moved into 13th place on the all-time scorer’s list. Garrisson (1503) pushed past Jon Marstaller into 6th place. Plenty of highlight plays before an excited crowd. Four Gordon jams by my count. 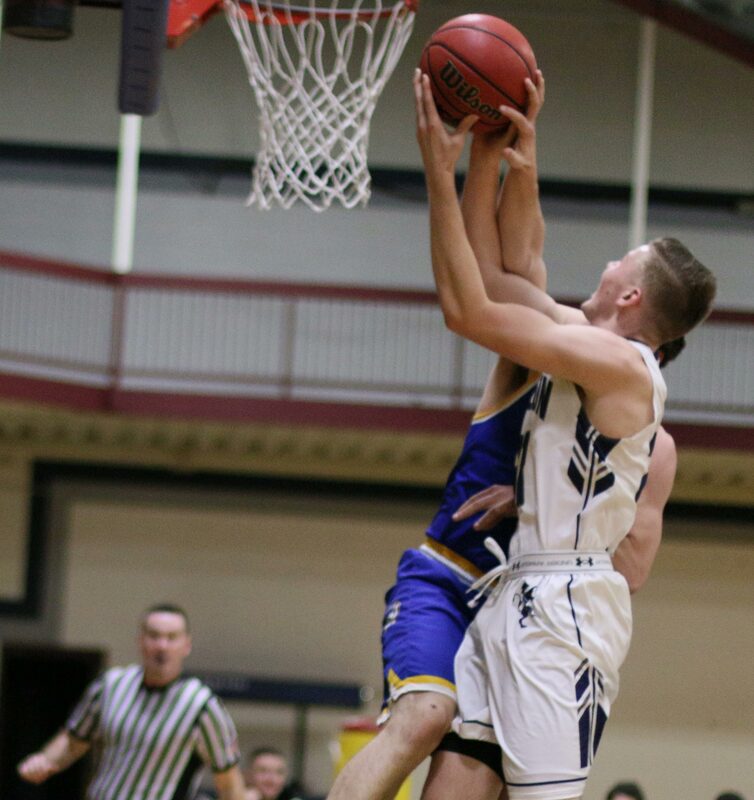 Eric paced GC with twenty-two points while Garrisson and Noah Szilagyi each had twenty points. Garrisson also added twelve rebounds. The twenty points was a career high for Noah. 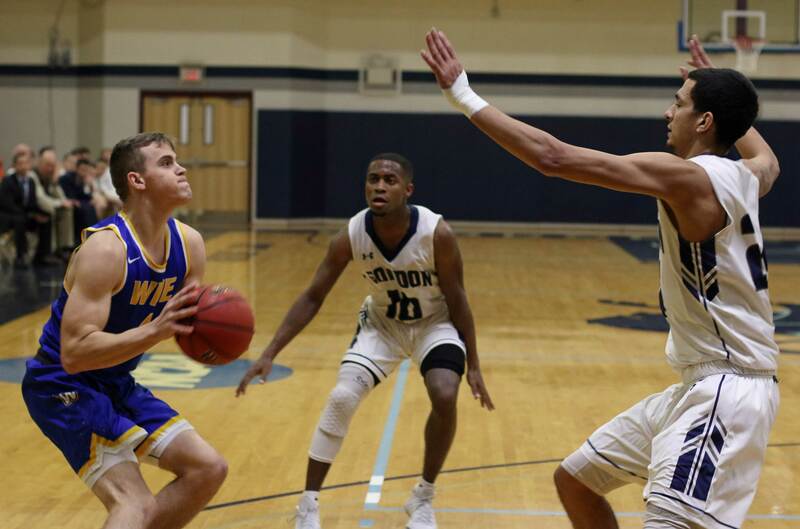 The senior reached eighteen points twice in his freshman year. Those of us who were at the Bennett Center for Saturday’s game with Curry noticed a significant difference three days later. In the Curry game the reserves took over with a 30+ point lead in the second half. The Colonels went on a scoring rampage and much of the comfortable lead was squandered. That didn’t happen against Western New England. (Wenham MA) Don’t let that final score fool you. 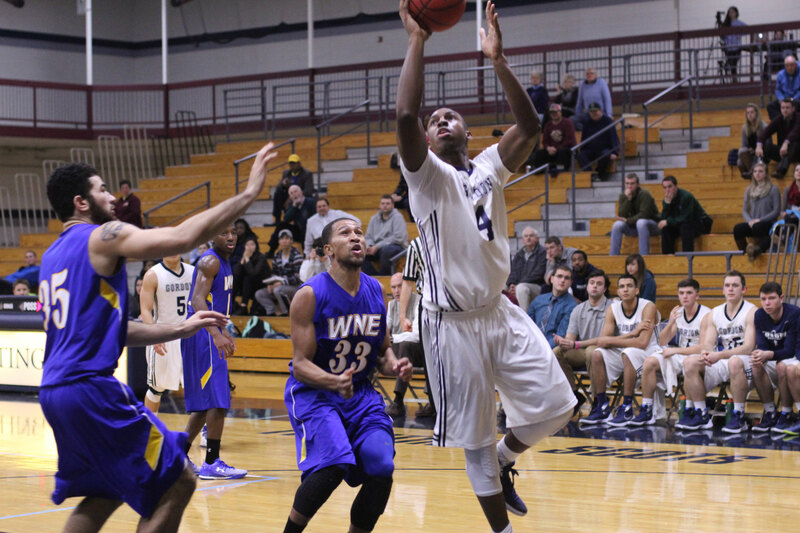 Western New England led by a point (74-73) with 2:38 left in this game. The outcome was anything but certain. 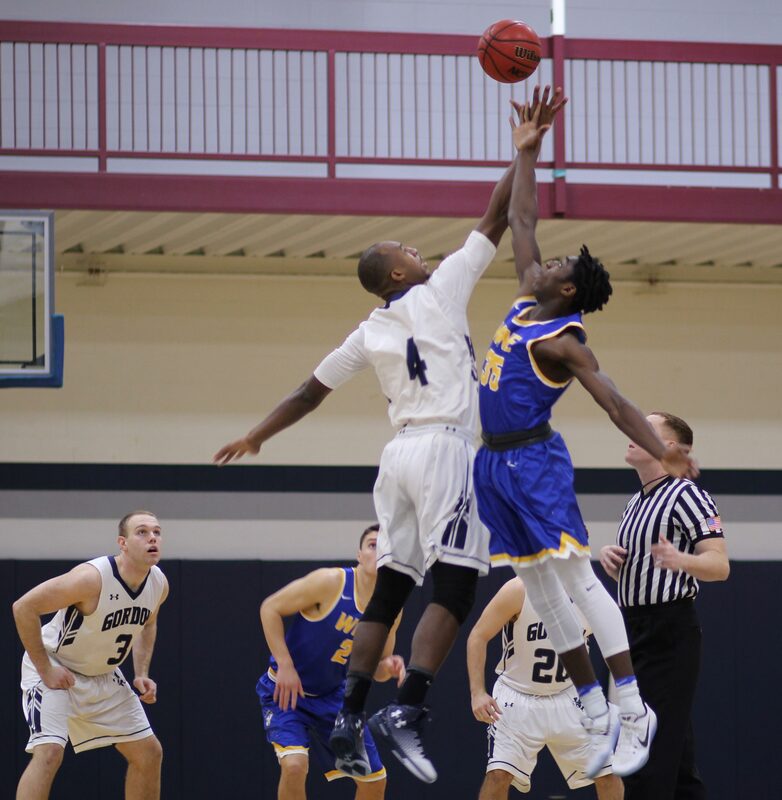 But the Scots (14-7) were offensively efficient down the stretch and posted a, 84-77, win on Saturday afternoon at the Bennett Center. 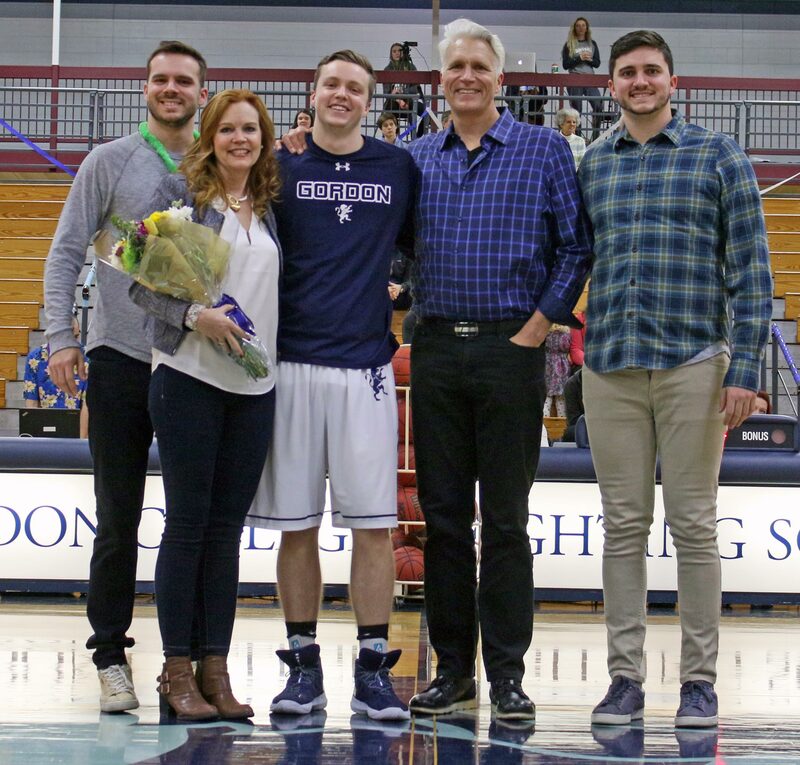 Special day for the Gordon faithful as the Scots four seniors (Jaren Yang, Steve Vampatella, Jake Hart, and Graham Tienhaara) were honored. 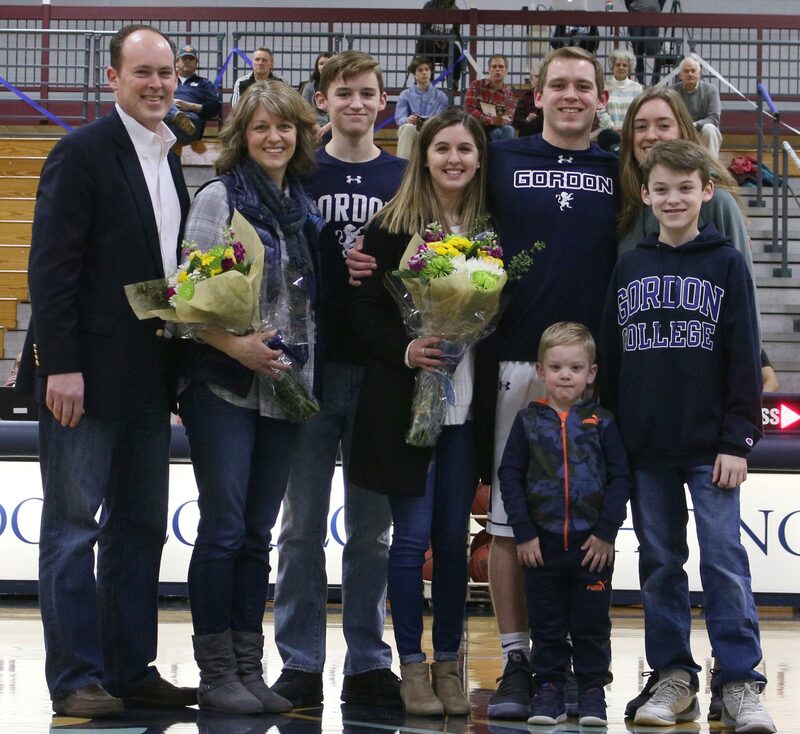 Traditionally, the Gordon seniors start on Senior Day. That put first-time starters Steven Vampatella and Graham Tienhaara out there to open the game. The senior foursome plus Eric Demers got off to a terrific start. 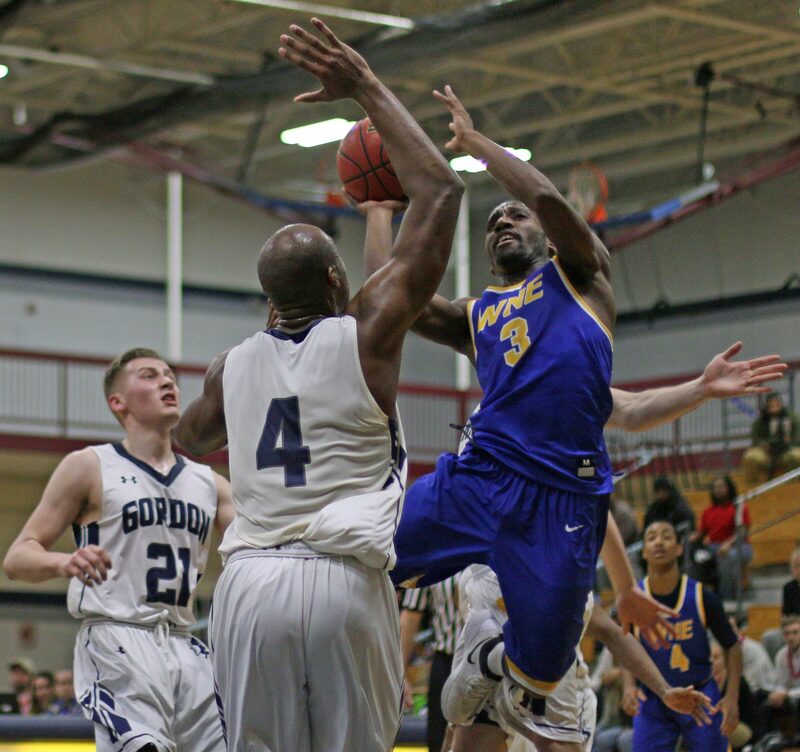 “I thought that Gordon came out with terrific energy,” said Western New England coach Colin Tabb afterwards. Graham Tienhaara spins left for two in the early going. By the time Graham Tienhaara went to the bench, he had six points and Gordon had a seven-point lead. “Graham got us off to a great start,” said Gordon coach Tod Murphy. 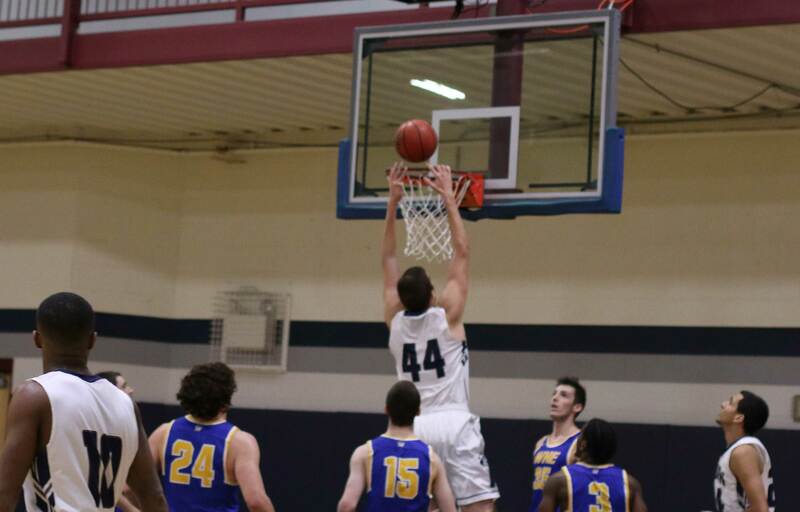 Behind Eric Demers’ twenty-point first half the Scots were ahead, 48-38, at halftime. 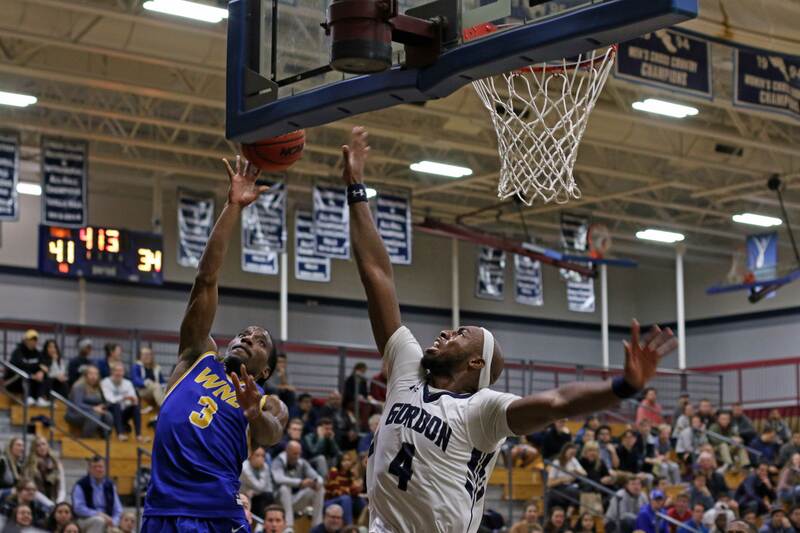 Sixteen days ago, the Golden Bears (8-12) routed the Scots, 101-83, in Springfield so you had to expect that they would make things interesting in the second half. And they did. 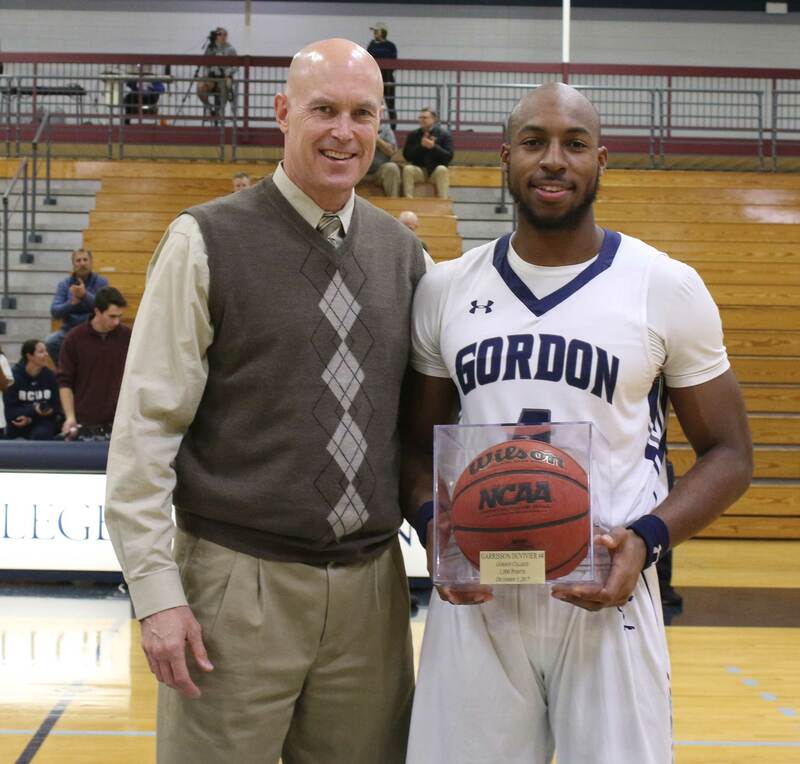 Mikey Pettway had thirty-one points and scored his 1000th point in the previous meeting. This time around Mikey was off (13 points) but freshman EJ Day (28 points) more than made up for it. “EJ Day is going to be a load to go against over the next three years,” said Coach Murphy. EJ, like Mikey, displayed the ability to get shots off from anywhere despite being 5-10. EJ made three’s and showed his quickness getting to the rim. 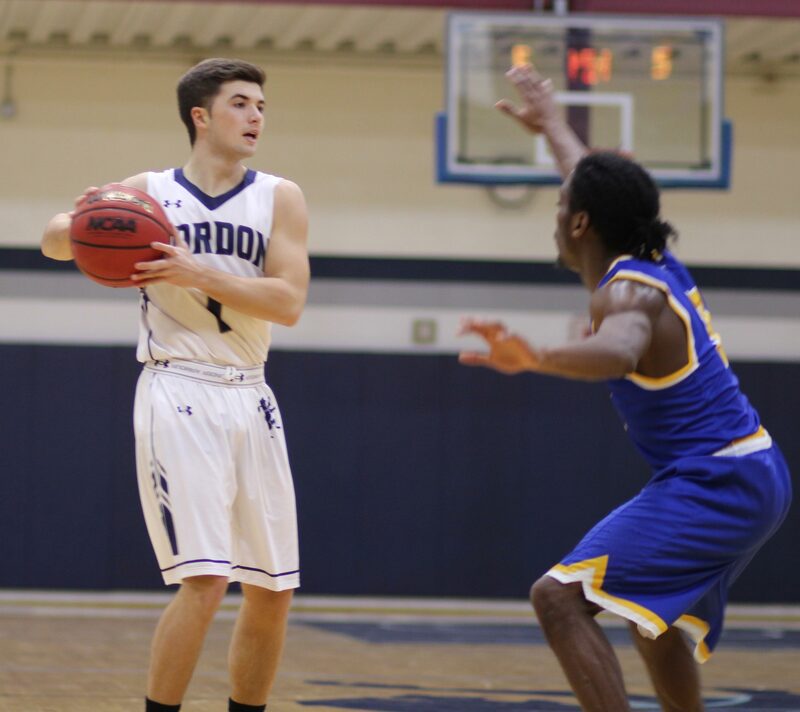 Gordon led by sixteen (60-44) with 16:44 left. But WNE didn’t go away. Over the next 6+ minutes they overwhelmed the cooled off Scots. An 18-2 run evened the teams at 62-62. We had ourselves a ballgame! What happened during that stretch? 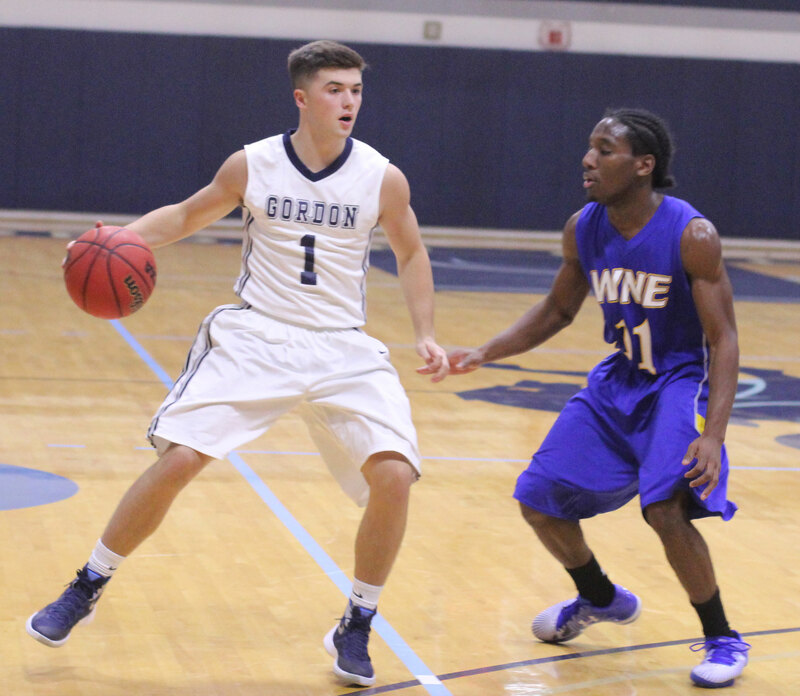 Gordon made one of nine shots, including five three’s, and had three turnovers. 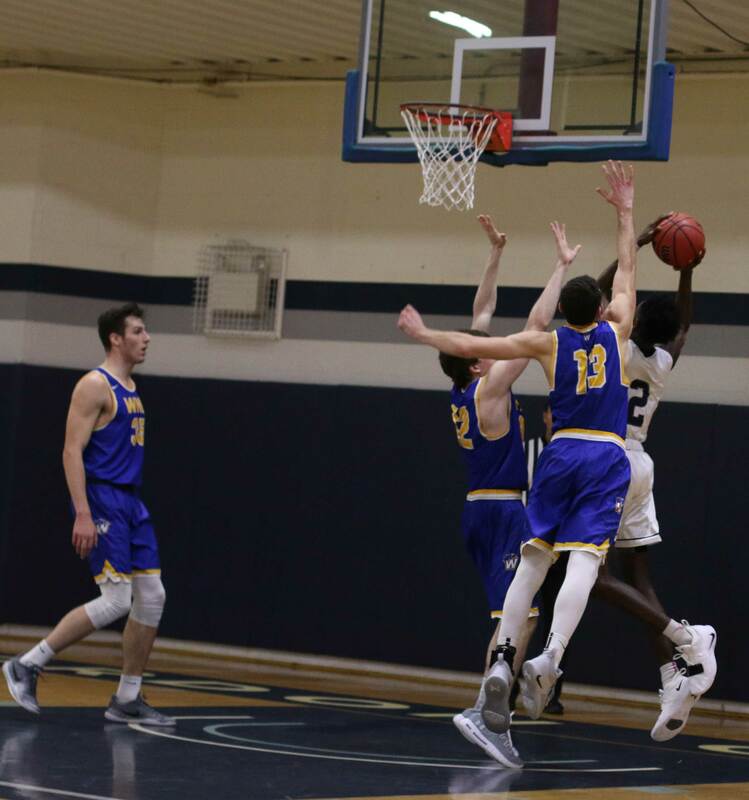 Then there’s Western New England: The Bears made seven of thirteen shots, with three of those seven baskets coming after they had grabbed offensive rebounds. Gordon recovered to regain the lead but could never push their margin past three points. 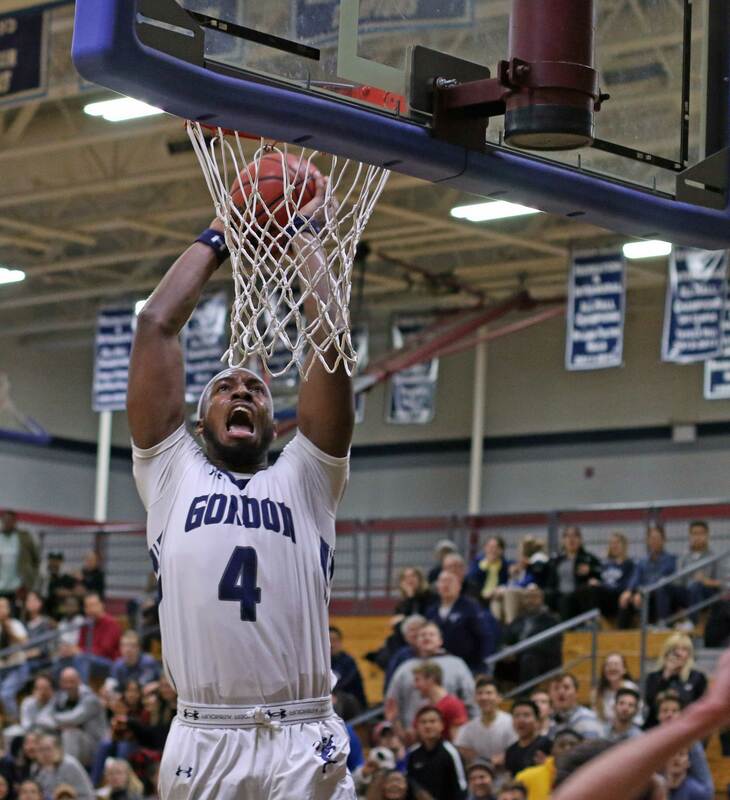 Finally the Bears caught GC and went ahead (74-73) with 2:38 left on two EJ Day free throws. The rest of the way: “We made the plays we had to,” said Coach Murphy. 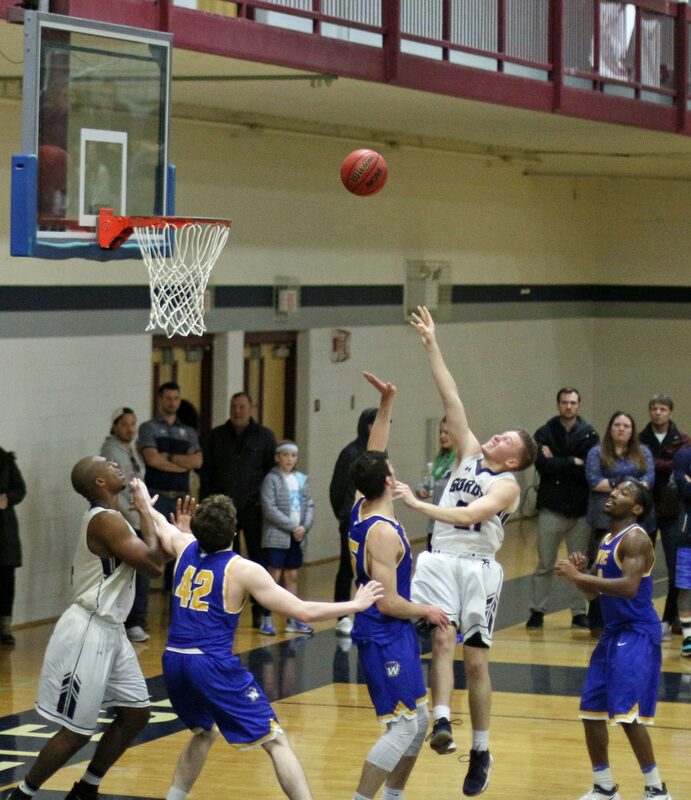 Eric Demers immediately made a three to give GC the lead for good as it turned out. 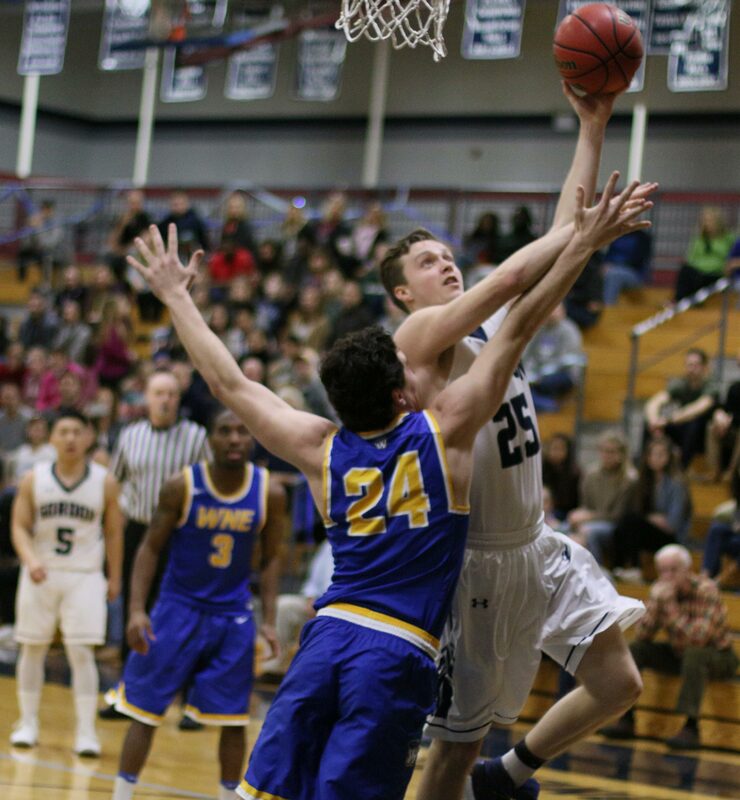 But there was also a key layup by Garrisson Duvivier in the last minute assisted by Jaren Yang. 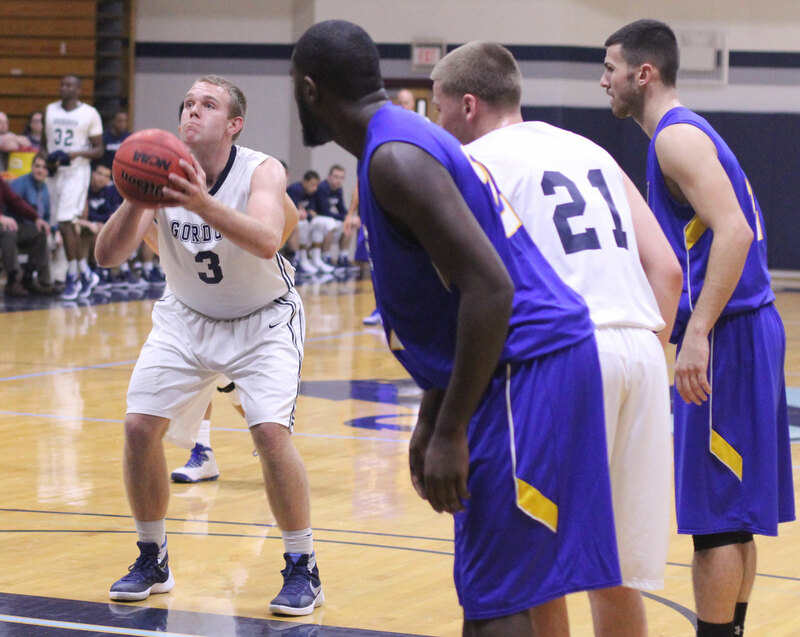 Free throws were crucial and Jaren, Eric Demers, and Jake Hart made them. Actually, Jake missed one but miraculously the ball stopped dead on the back of the rim with fifteen seconds left. That’s a jump ball and the possession arrow favored the Scots. So Jake’s missed shot gave Gordon a fresh possession. 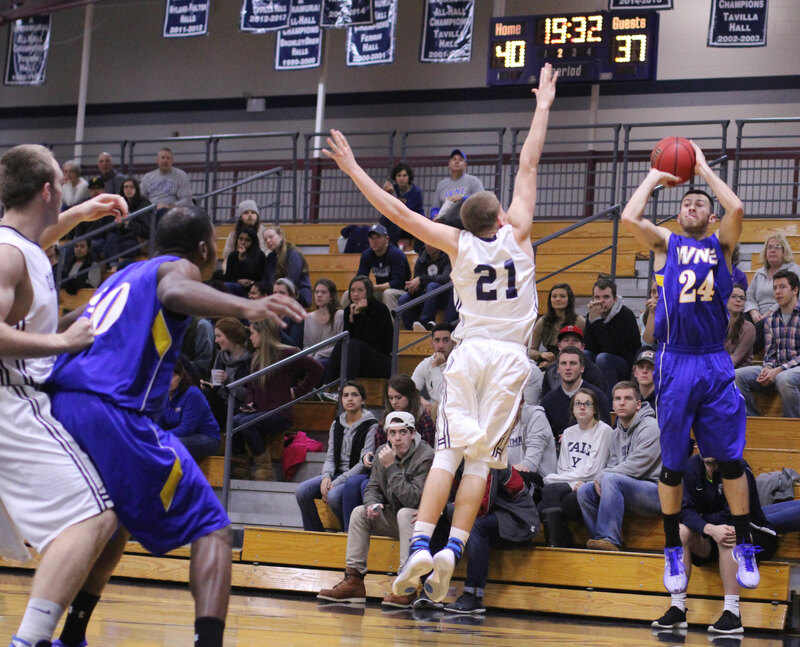 Eric Demers put up a career-high forty-one points with twenty in the first half and twenty-one in the second half. In this breakout season, Eric has been able to get off shots against defenders of all sizes and speeds and shoot over 50% in twelve of the games. 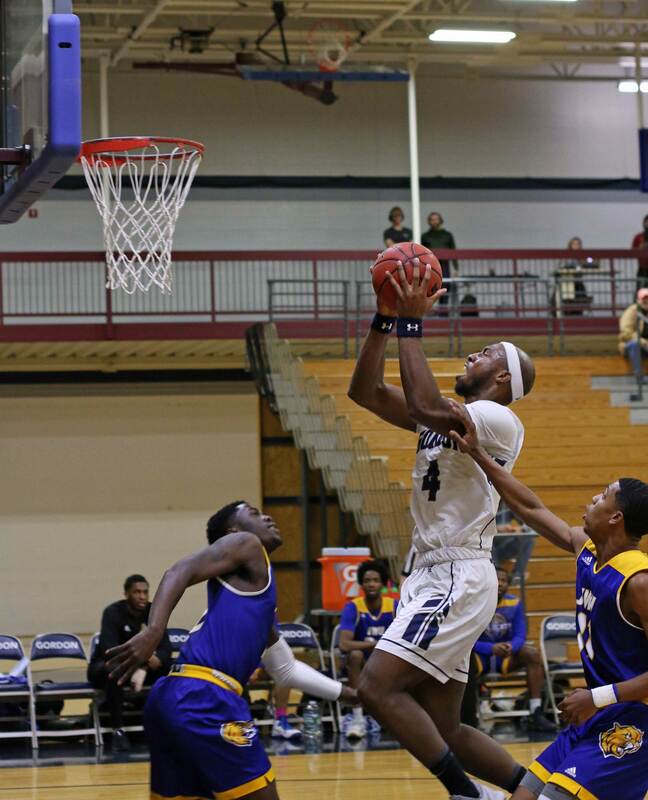 Junior Garrisson Duvivier had his 15th double/double of this season. He had sixteen points and fifteen rebounds. 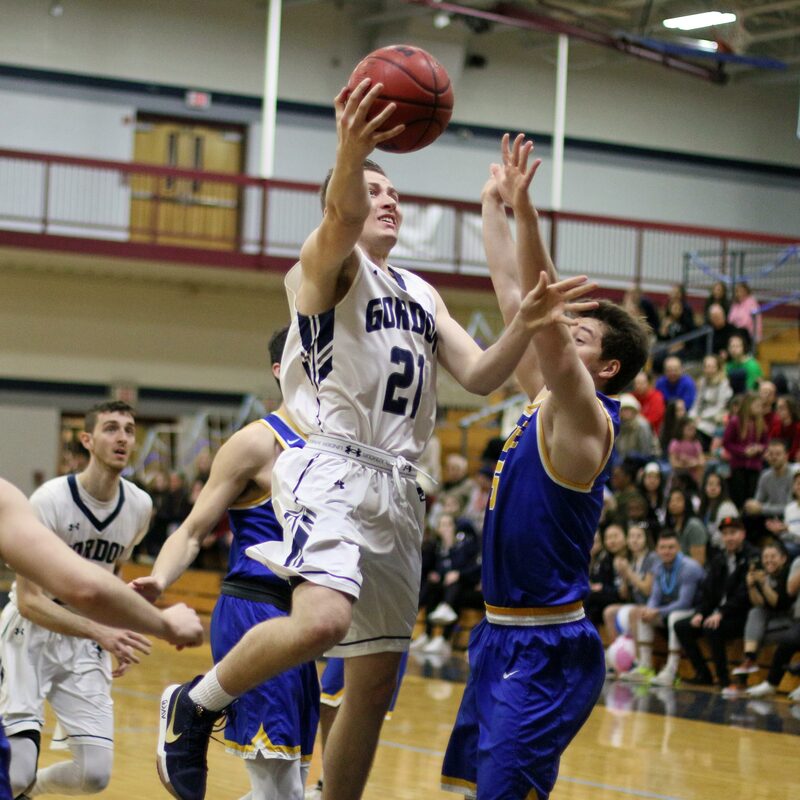 Ahead is a neighborhood battle with Endicott on Wednesday night (7:30PM) in Beverly. The winner of that game will be in second place in the Commonwealth Coast Conference behind Nichols. In the previous Gulls/Scots matchup it was GC winning in overtime. 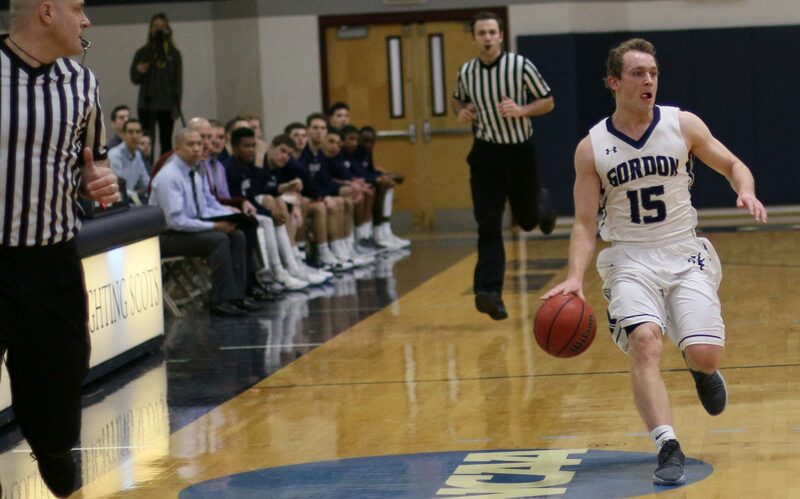 Realizing how hostile the atmosphere can be at Endicott, it would behoove the Scots to defeat the Gulls and avoid having to play a tournament game in Beverly. Two concerns in this game (for me) were the squandered lead and the twenty turnovers. Players not named Eric and Garrisson need to lighten the scoring load on those two to prevent point-droughts when either of them cool off. This afternoon’s twenty TO’s was the third time it has been that high. The other two times were losses. The Bears’ pressure had no part in the turnovers. It was the passing. Too many high-risk attempts. Nice gathering afterward to hear the coaches retell the exploits of the four seniors. The players will be missed. Three weeks from now I could be writing about Gordon’s third CCC title in the last eight years. Hope so. Jaren Yang collected his 4th career block this afternoon for those keeping track at home! 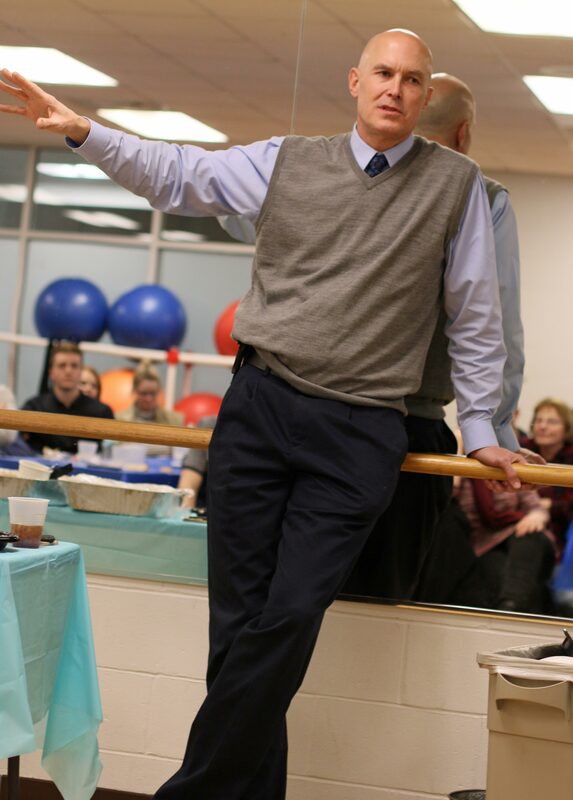 “I was hoping to get Steve and Graham back into the game at the end, but it was so close,” said Coach Murphy. “Good teams have to win tough games like this one,” said Coach Murphy. Gordon has won ten of their last twelve games. 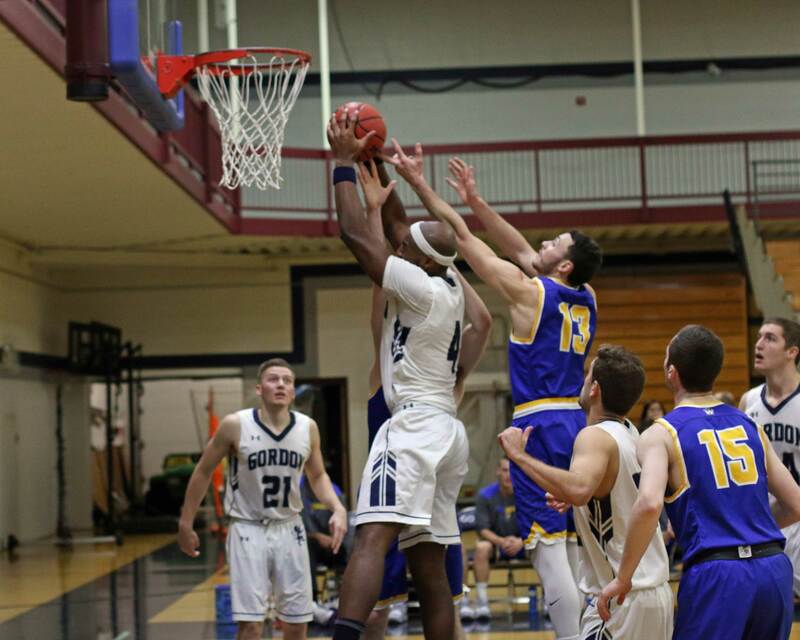 Gordon has now won nine of their last ten games with Western New England. 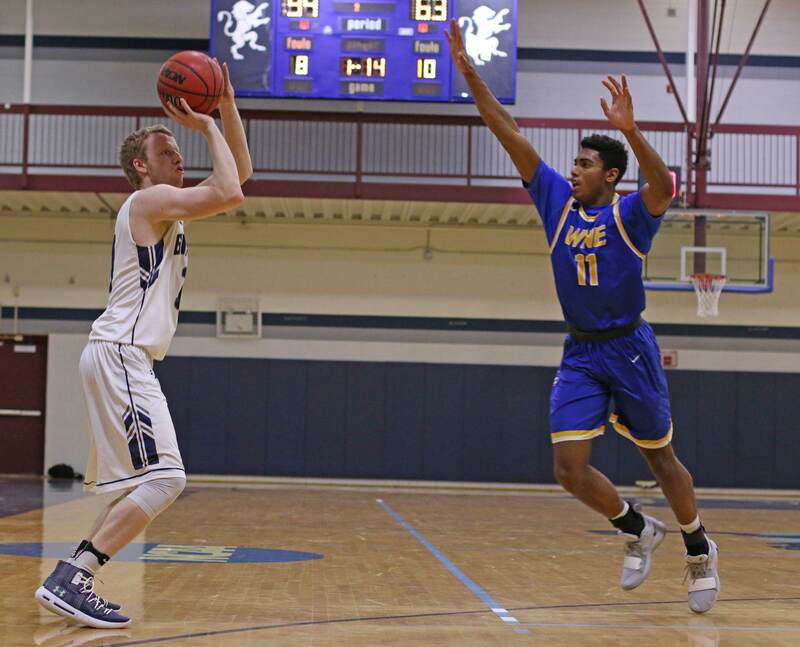 Western New England had a win over top-ranked Nichols at Nichols in early January. They meet again in Springfield next Saturday. 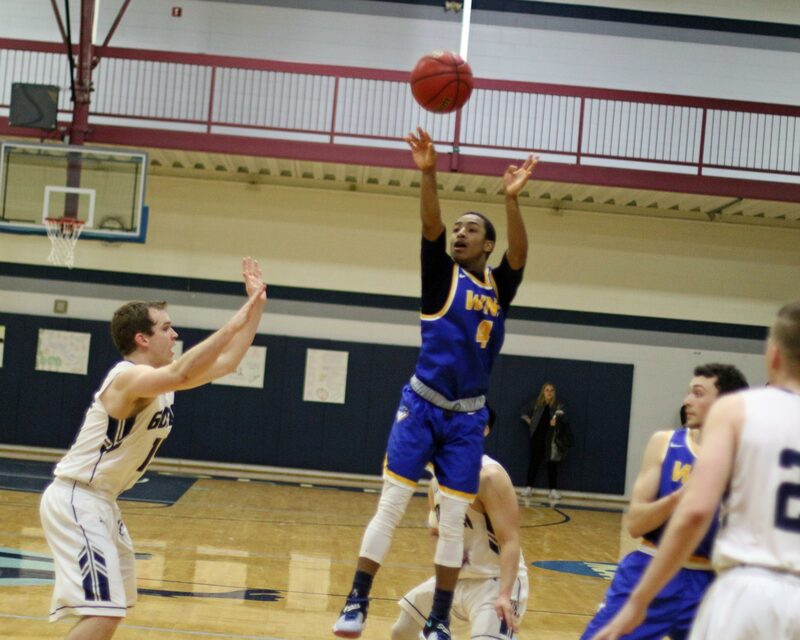 Junior Mikey Pettway reached 1000 points in tonight’s game. 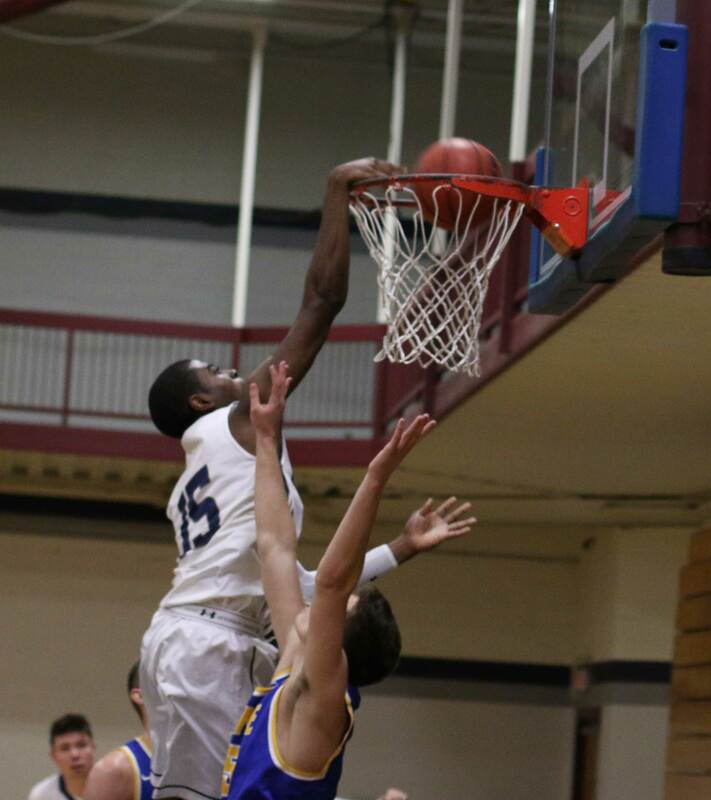 (Amesbury MA) They came to see junior Mikey Pettway get his 1000th point and that’s not all they got. The entire Western New England team played like thousand-point scorers as the Bears (7-8) dominated the Scots from beginning to end. The GC winning streak ended abruptly at six. 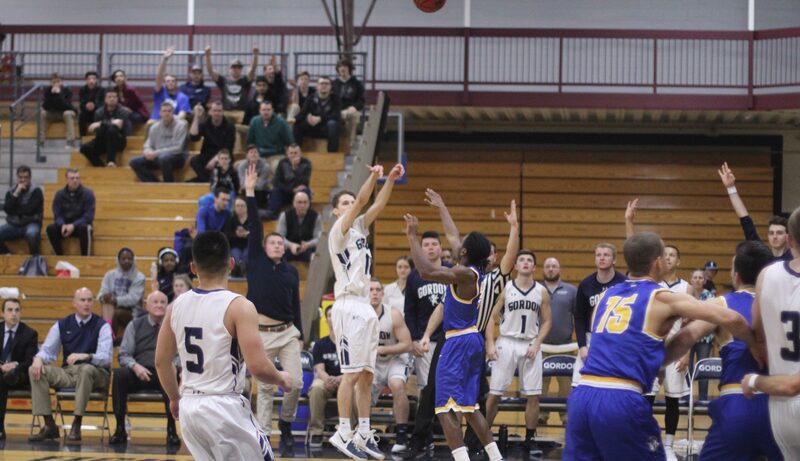 Also ending was a nine-game winning streak the Scots had against the team from Springfield (MA). 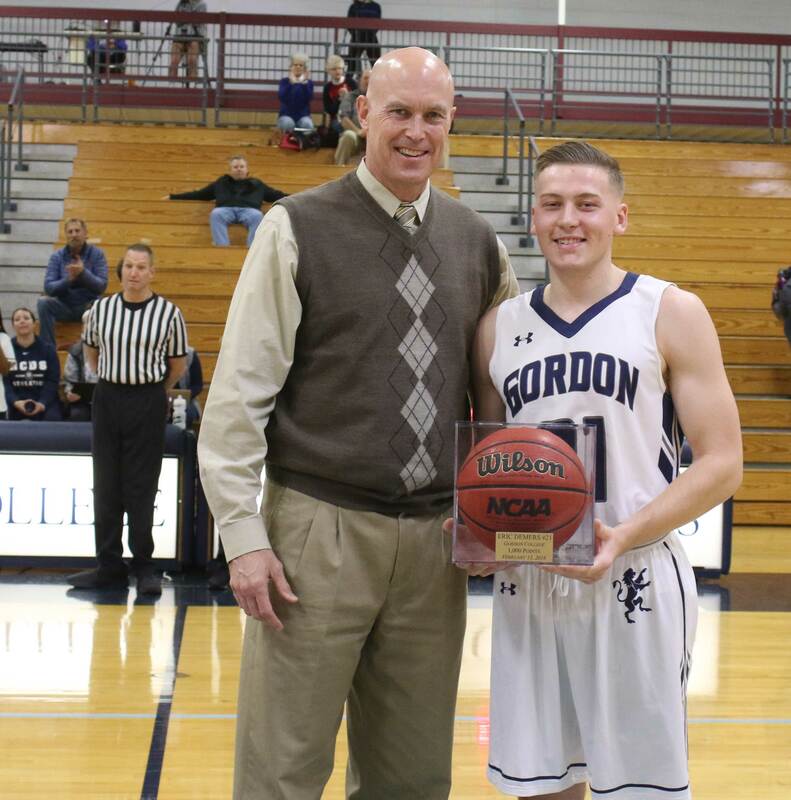 Mikey Pettway got his 1000th point in the first half and he got GC’s top scorer (Eric Demers) in foul trouble in that first half as well. The Golden Bears feasted from long range in the first half making nine from out there. The home team never trailed. 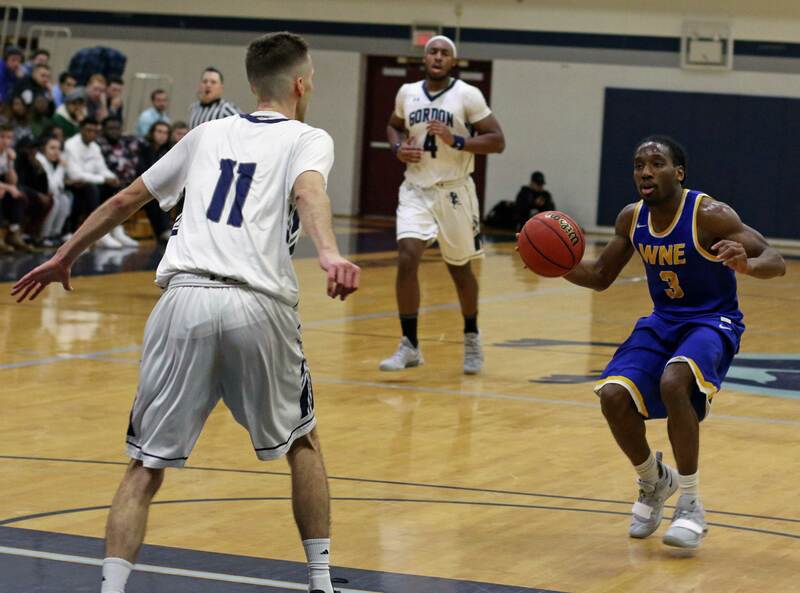 Despite the loss, Garrisson Duvivier outdid his amazing game of two days ago against Roger Williams. Tonight’s was better because Garrisson missed only seven shots. Who knew that he would become such a good foul shooter (8-for-9)? 26 points, 17 rebounds, 5 assists. 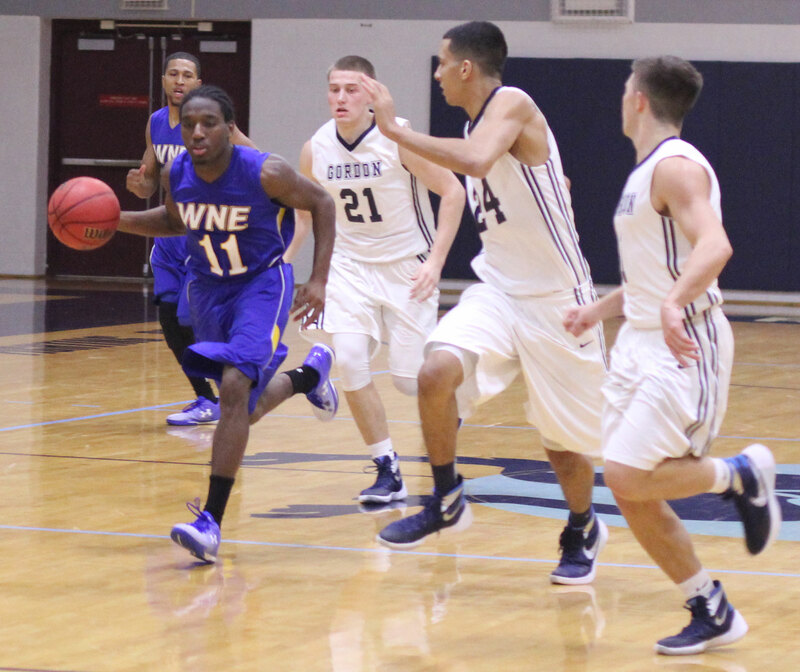 That six-game win streak carried some weight despite the fast start by WNE. The Bears will cool down and the Scots will shoot by them….at least that was what I thought would happen. Into the second half, I was feeling pretty smart. Eric (Demers) came out making shots and 3+ minutes into the second half the score was 55-50. But then Eric picked up his 4th foul and had to come out. 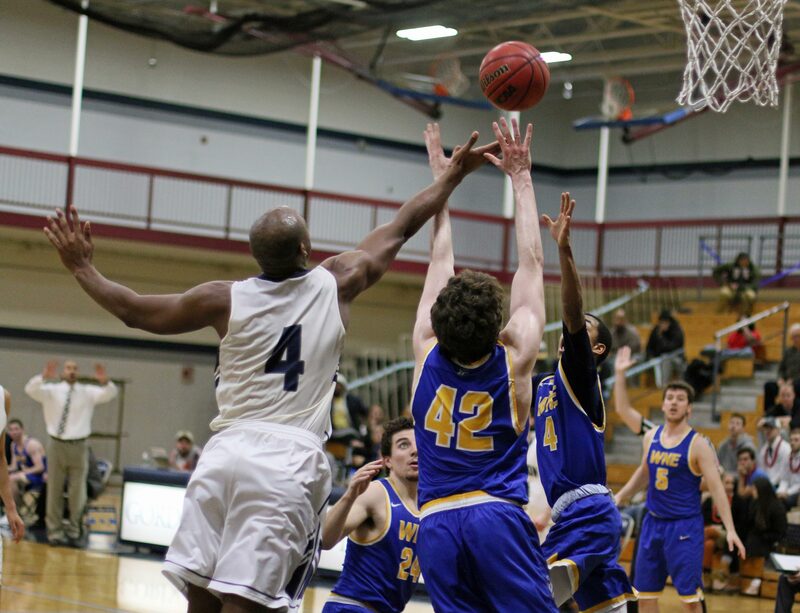 I said to myself at the time, “Someone is going to have to pick up a lot of scoring or this game is going to get away from us.” That “someone” never appeared and Western New England continued to roll offensively. By the time Eric (and his four fouls) returned (9:39) the home team led, 74-57, and the cows had left the barn. Eric put up some points, thereafter, and Garrisson had his way in close but the Bears offense never ran out of good shots as they collected 101 points. 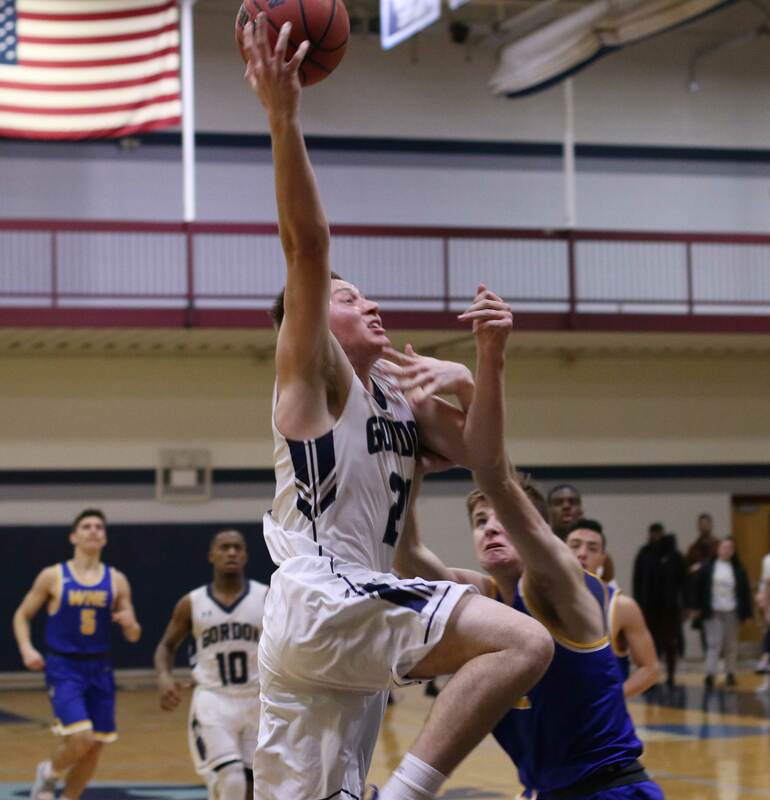 That is the third time an opponent has scored 100 points against GC and none of the games ended happily for the team from Wenham. Obviously, the Gordon defense had a subpar evening and it cost them. Ahead, on Saturday, is a trip to Milton for a game with Curry. The Colonels have yet to win a Commonwealth Coast Conference game this season. Last year they nearly upset the Scots in Milton. 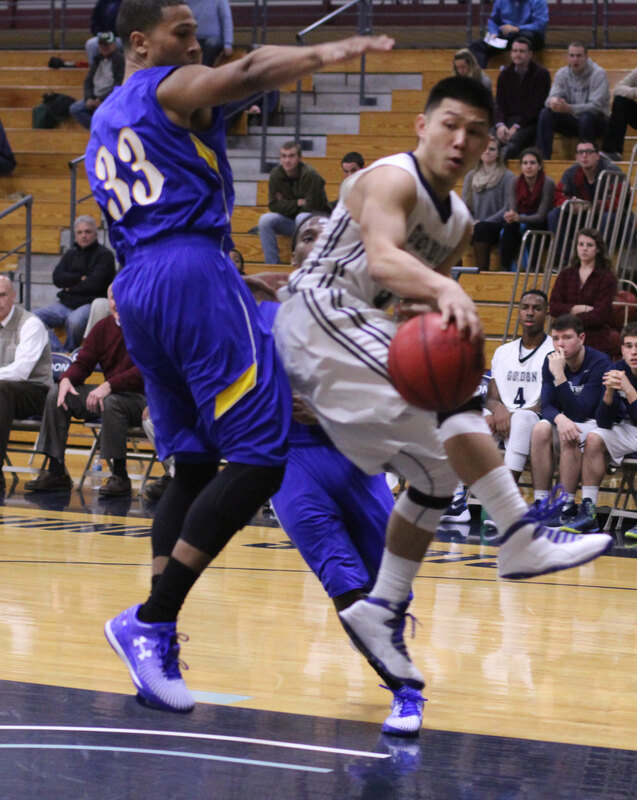 Jaren Yang continued his run of good numbers with fourteen points and six assists. Jaren made four three’s for GC. A key to the recent Gordon successes has been the contributions of the second unit. Those contributions didn’t happen in this one. Instead of closing the gap against WNE, the gap widened. Meanwhile, the Bears had six players in double figures. Their best stat? They had twenty-one assists and six turnovers. 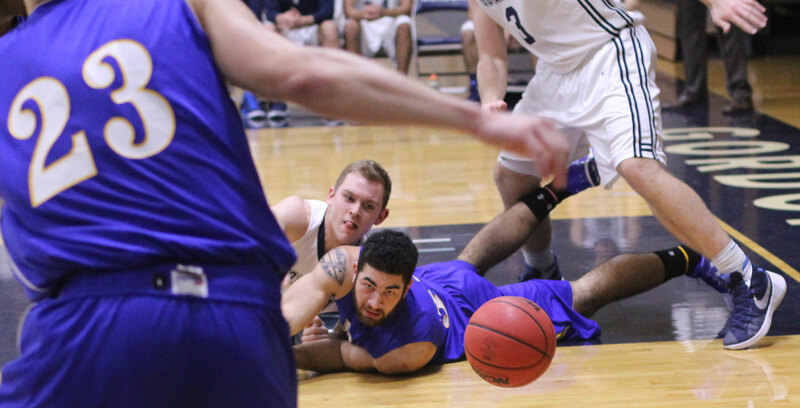 You watch the way Western New England played tonight and you could see how they could defeat Nichols. The Bears consistently made shots and the Bison had some cool spots. The “cool spot” for Gordon tonight was early on and they never recovered. Avelino Damoura made his Gordon debut in the final minutes. (Wenham MA) This was one of those, “Remember the game……,” games. 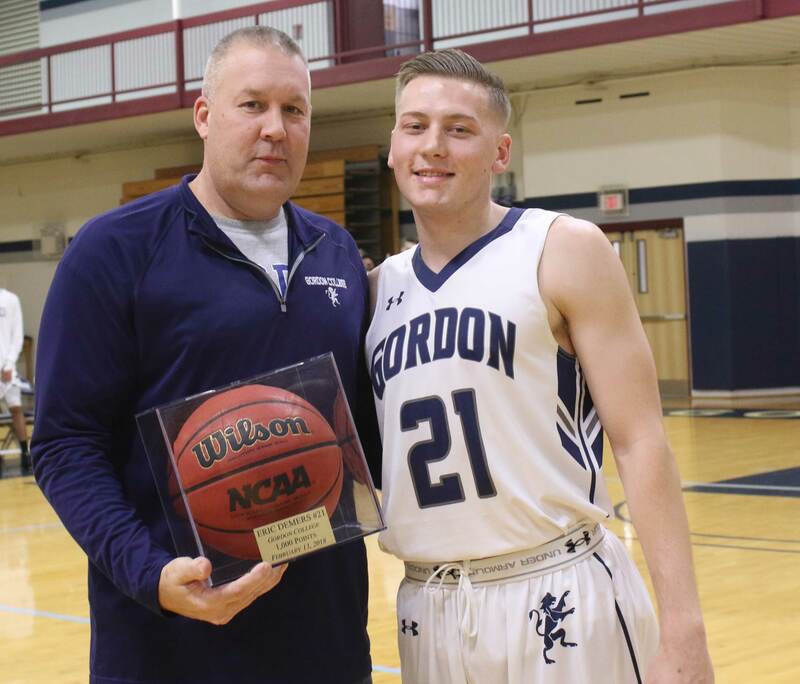 Senior Sam Johnson had a memorable Saturday afternoon as Gordon defeated Western New England, 74-59. Sam already had double/double by halftime and ended up with a career-high twenty-seven rebounds to go with sixteen points. The Scots (10-7) were hot early (13-2), squandered most of it (42-40 five minutes into second half), and then reheated in the final ten minutes to carry the day. 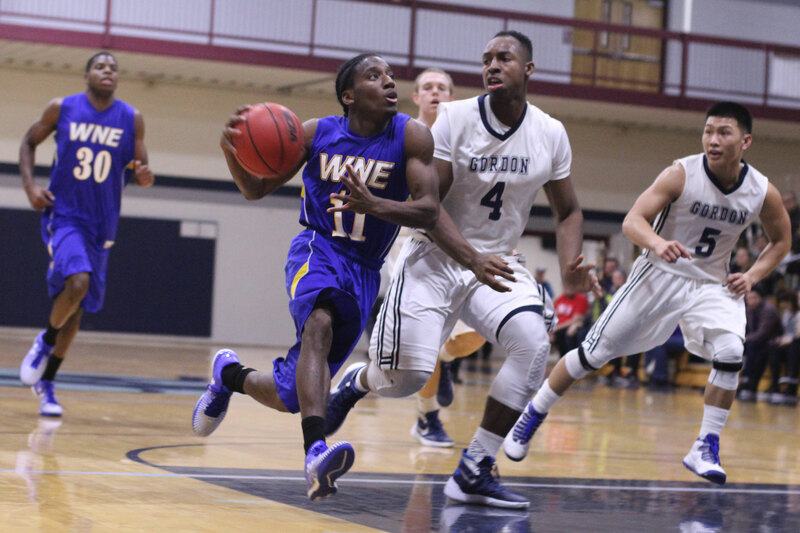 Western New England (3-13) shot poorly (33%) and was buried (45-29) on the boards. Plenty of negatives for the Bears but one giant positive was their pressure defense. They turned GC over TWENTY-SEVEN times. Last time the Scots had a number like that was in February of 2013 against ENC. Trying to dribble through double-teams and passes to who-knows-where made the performance look like something you’d see in early November. GC can absolutely expect full pressure in next week’s games (ENC on Wednesday, Nichols on Saturday) and must be better than they were today to face it. It’s pretty bad when the team wins and I’m crying about style points! The good news? 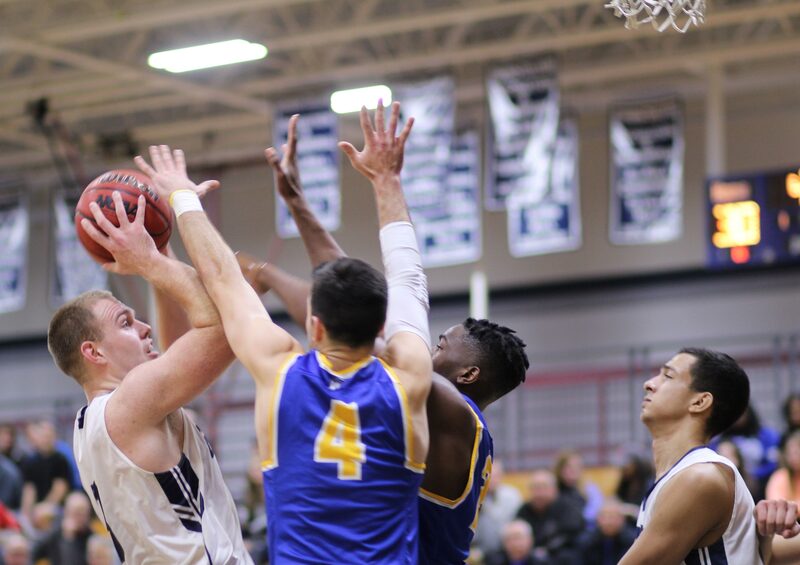 The Scots are in the hunt in the Commonwealth Coast Conference, one back from Endicott and Roger Williams with three losses. Streaking Wentworth gave Nichols their 3rd loss this afternoon. I am not sure what concerns me more; facing Wentworth in a game that matters or those twenty-seven turnovers this afternoon. 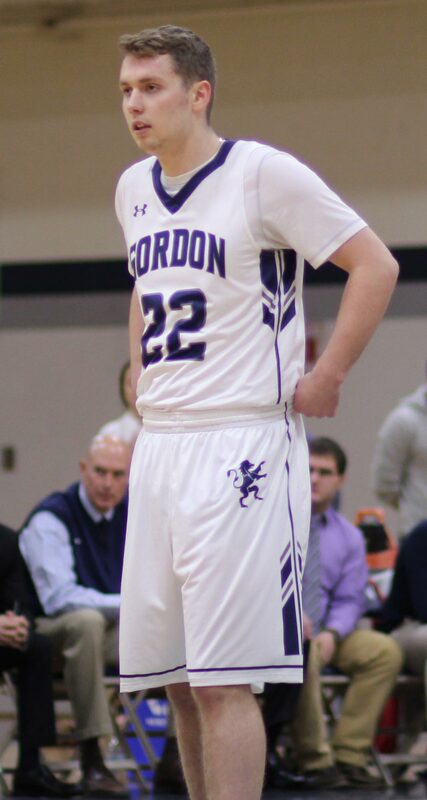 Jake Haar was part of the GC hot start with three 3’s in the first half. Noah was also on target from beyond the arc (or was it ark?) with three of them which is a season high. 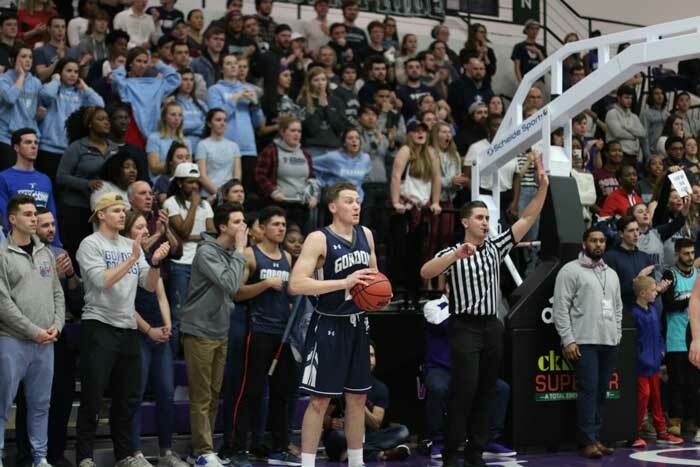 A couple of Noah’s triples in the second half of the second half excited the Bennett Center partisans as the Scots rode his accuracy to double-digit leads. The Bears were severely beaten up on Efficiency. The combination of poor shooting and few rebounds did in the team from Springfield (MA). None of the Bears even reached ten in Efficiency. Sam Johnson scored sixteen points. 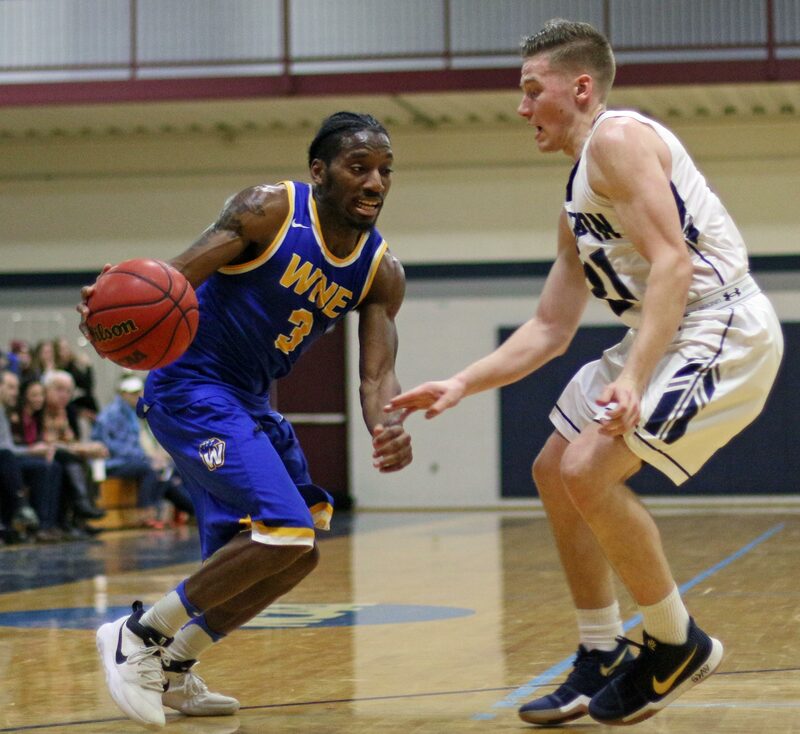 WN has a win over Endicott and only lost to ENC by three. The Scots escaped a close game as well because the Bears’ shooting (1-for-10 on 3’s in the second half) was off. Three more home games left. I have not been overwhelmed by the student turnout yet. Freshman Mike McCourt was the Bears top scorer. I was impressed with his Rajon Rondo fake pass driving the lane. Sam’s record-setting performance wasn’t really a surprise. Why? He plays the same way every game…all-out. He wants every rebound and unless teams find ways to prevent him, he’ll get more rebounds than anyone else. 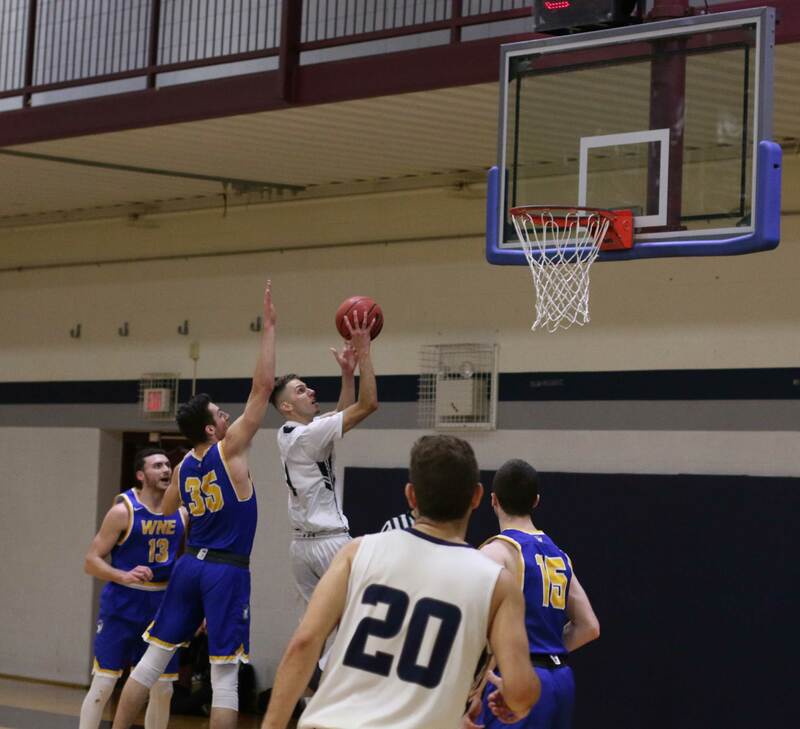 Against Western New England, last in the CCC in rebounding, you went in liking his chances of having a big game on the boards. (Springfield MA) Perfectly delightful final 1:40 for the Scots in Springfield tonight. Gordon (8-10/5-6) had everything go their way in those final one hundred seconds and a discouraging four-game slide came to an end. 74-70 was the final score with Western New England (6-12/4-7) getting on the wrong end of it. Crucial win for GC. Why? The Scots, at least temporarily, stopped their descent into can-we-make-the-playoffs territory. 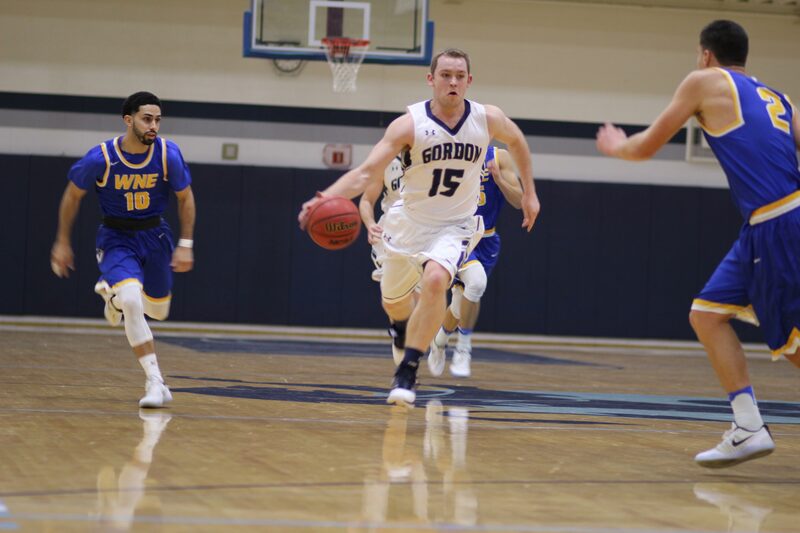 Gordon now holds the tie-breaker over Western New England with their two wins over the Bears this season. A great web feed from WNE. I usually have an IPad going along with my computer to catch the play-by-play as I watch the game. Works for me. Part of the delight in the end game tonight was watching the other team try the easy-fix, long-range approach. It didn’t work for them either. 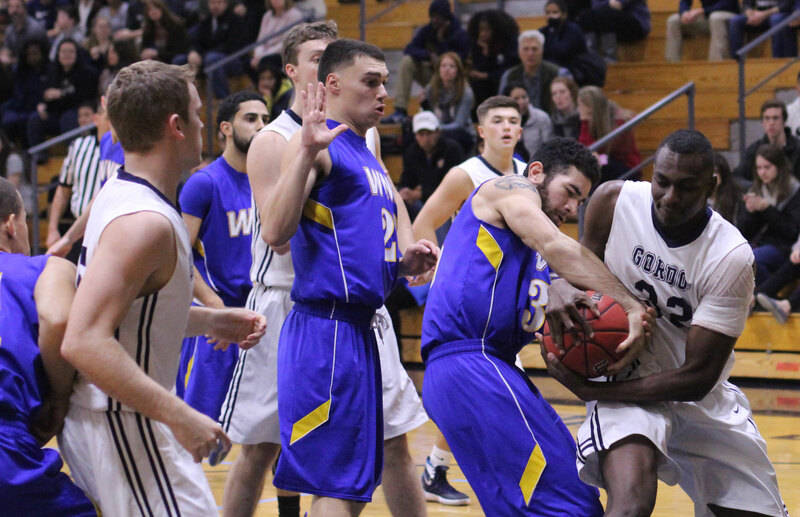 WNE made one-of-four tries but it wasn’t enough against a GC team that dominated the late-game little things, none of which included the launch-and-pray solution. In the successful end game, Gordon missed a layup but there was Garrisson to turn a rebound into a basket. GC up two (69-67). After a WNE miss, Garrisson was fouled. 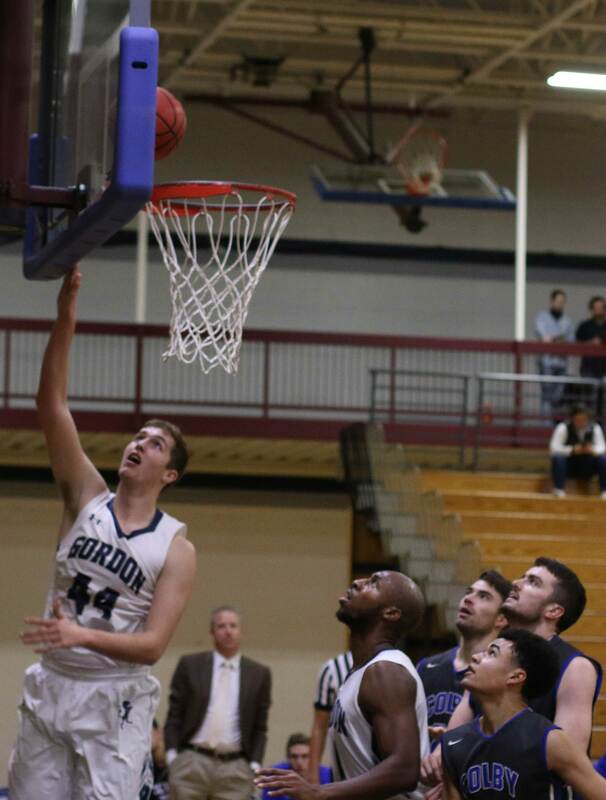 Made the first (70-67) and missed the second but there was Sam Johnson (top rebounder in the conference) to snare an offensive rebound and continue the Gordon possession. 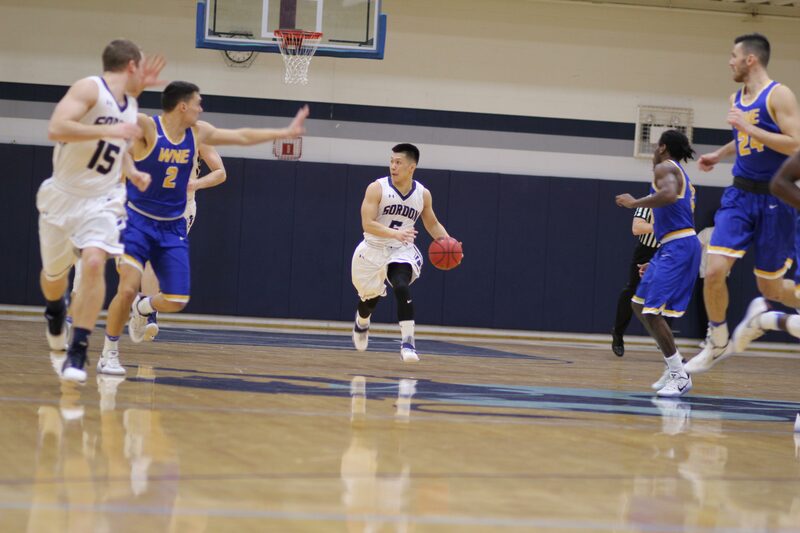 Jaren Yang was fouled and made both free throws. GC up five (72-67) with twenty-three seconds left. 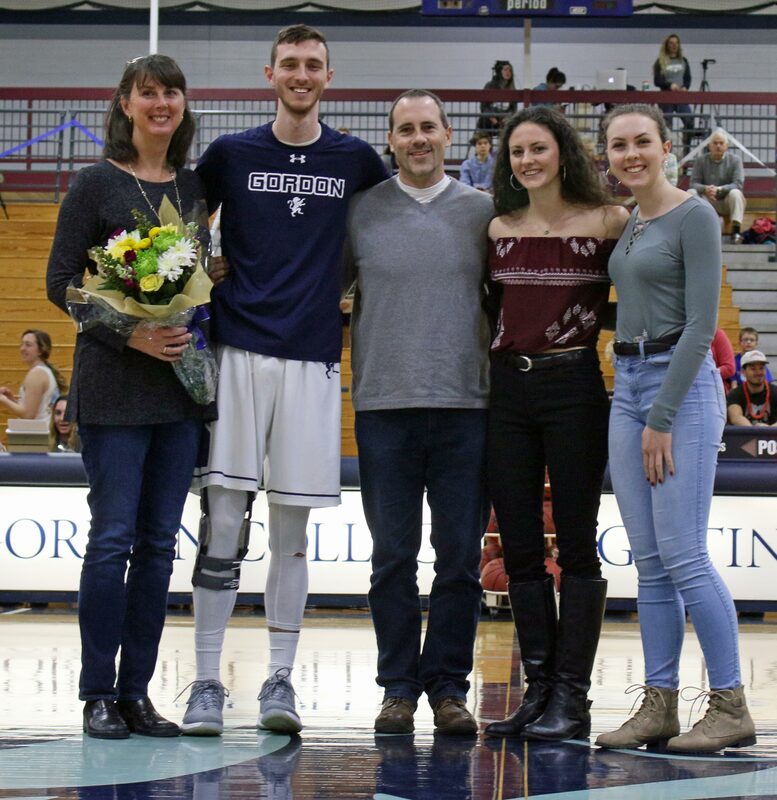 Mike Gelineau (24 points) connected long range putting the Bears close (72-70) with fifteen seconds to go. 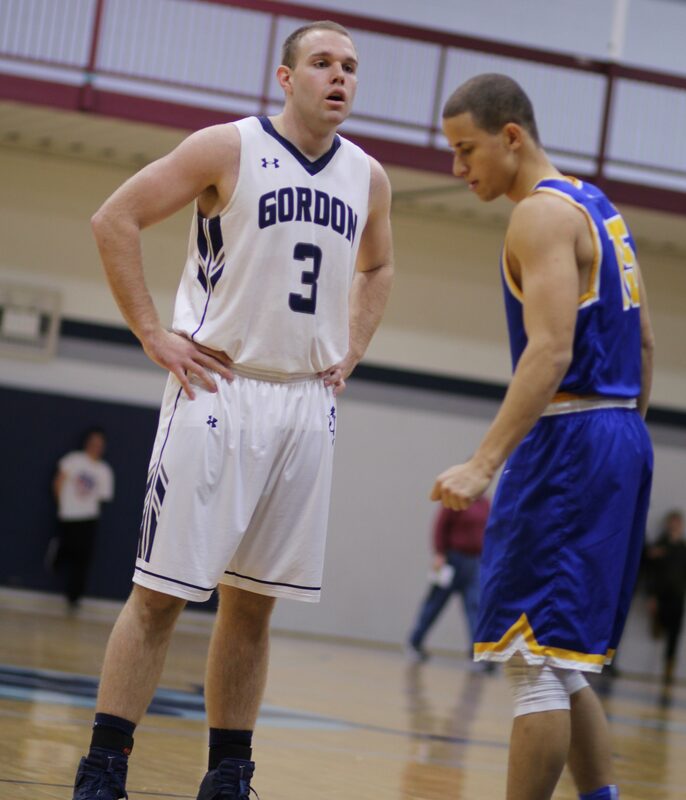 A timeout gave Gordon coach Tod Murphy a chance to get Noah Szilagyi into the game. Why important? 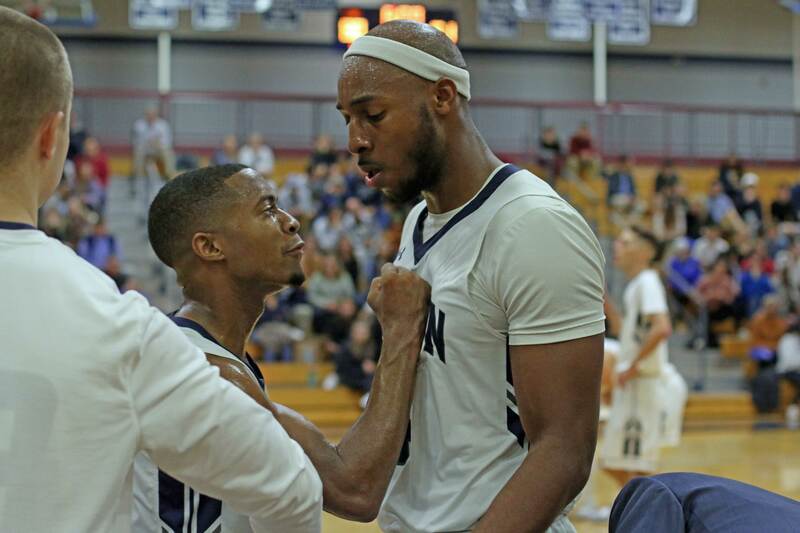 No question Western New England was going to foul. Noah was 23-for-26 from the foul line, including his last ten straight. In he came, got fouled, and put the game away with two straight money freebies. As I said at the start, everything came together in a nice victory package in the final 1:40. Before that? It was up for grabs. 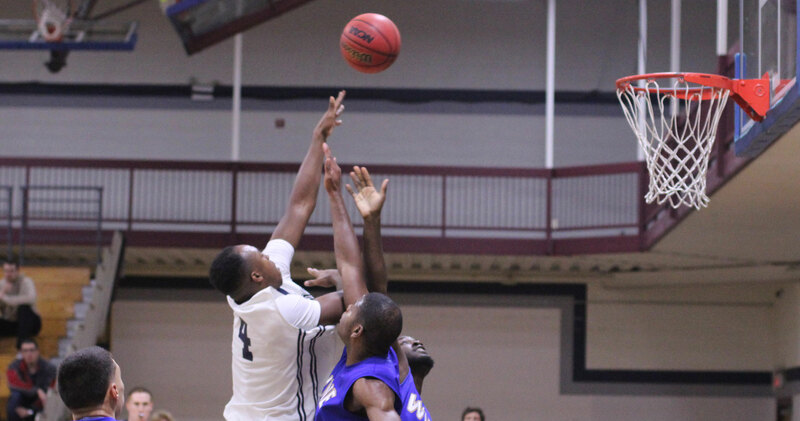 The home team had a 20-9 lead in the first half but the Scots closed in (31-29) by halftime. The second half was tight to the end. Unofficially I saw six ties and six lead changes. Anybody’s game for sure. On this night the visitors got the job done. It was close enough so that even the efficiency numbers for the two teams came out to 72. 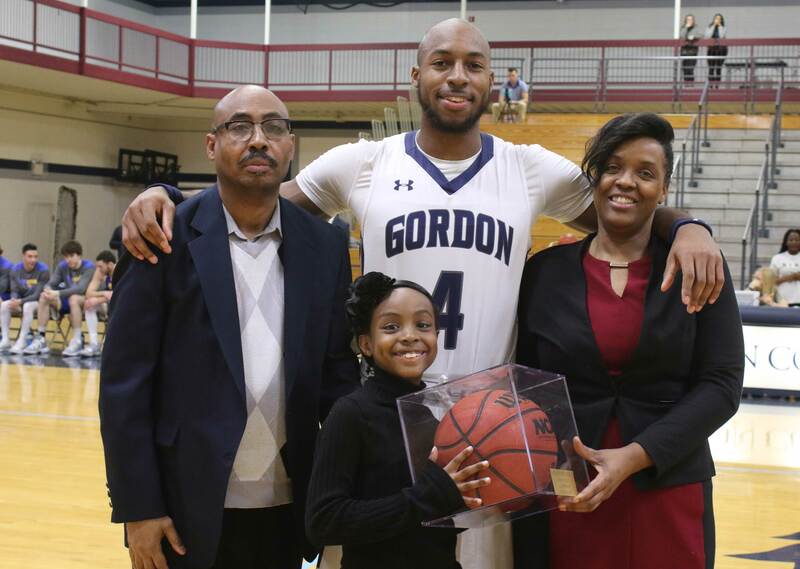 The heart of what Gordon does consistently well is the inside play of two of the best in the Commonwealth Coast Conference; Sam Johnson and Garrisson Duvivier. Sam (21 points/17 rebounds) hasn’t seen a rebound yet that he won’t go after with 100% effort. Garrisson (20 points) get shots to drop in the heaviest of traffic. Good to see Josh Ribeiro get some first-half action. Next up for the Scots will be ENC on Saturday (3PM). 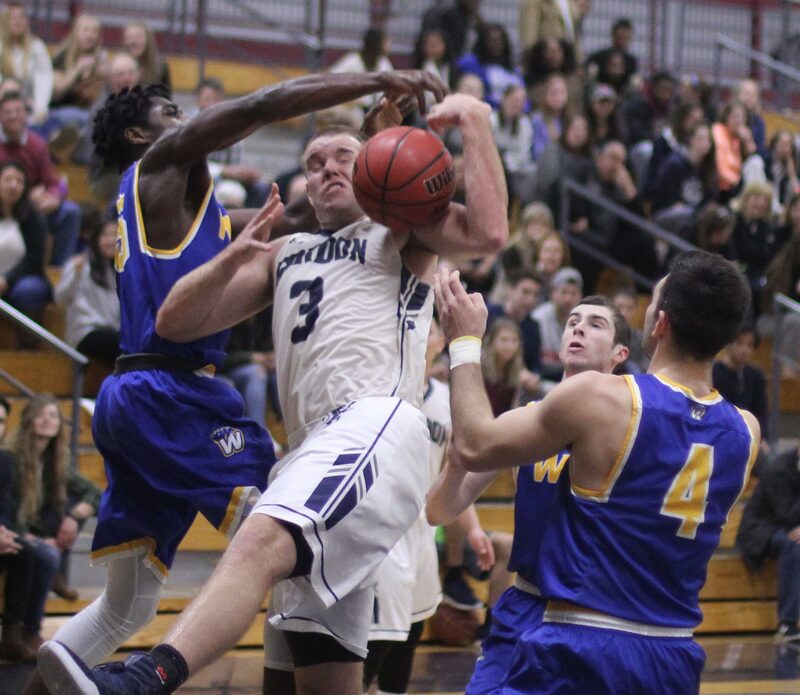 The Lions have beaten Endicott twice in case you’re wondering how good they are. 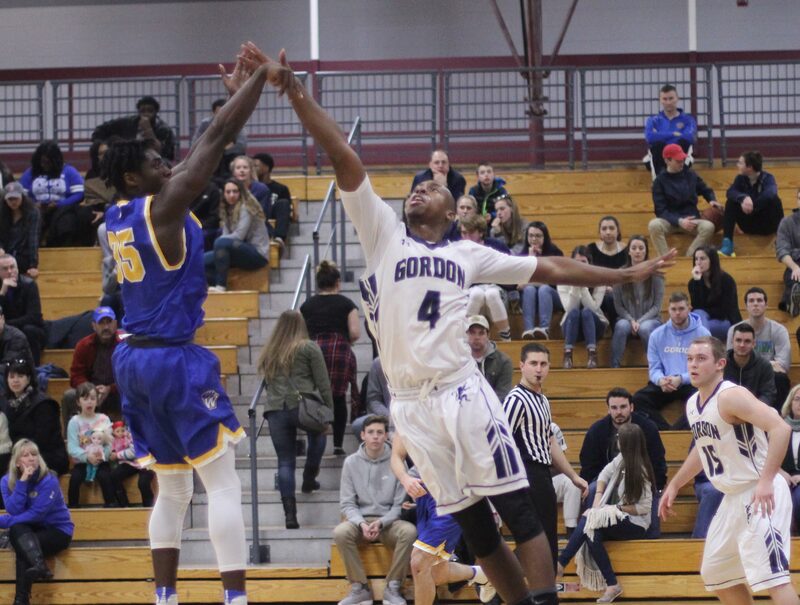 Gordon has not beaten any of the top five (Nichols, Endicott, Wentworth, ENC, Roger Williams) so far. A strongly supportive crowd at the Bennett Center might make the difference. 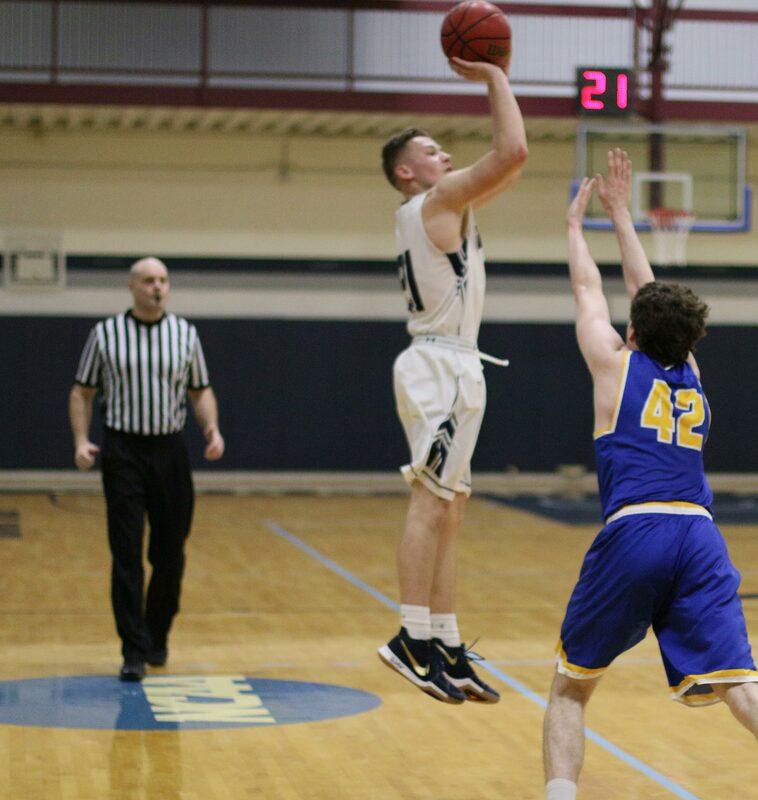 (Wenham MA) This was anybody’s game until the Scots pulled away in the final 6 ½ minutes to defeat Western New England, 73-62, on Wednesday night in the Commonwealth Coast Conference opener for both squads. The Golden Bears (1-4) trailed by just two (59-57) with 6:32 left but went into a serious scoring drought over the next 4+ minutes and never recovered. 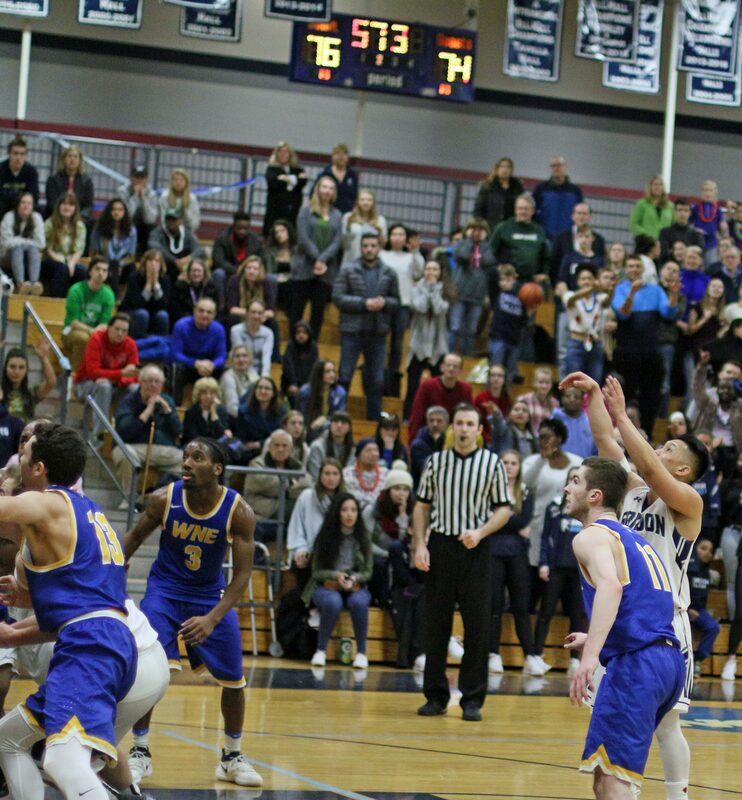 The visitors had only Mike Gelineau’s free throw to show for the extended dry spell. Meanwhile, Gordon (3-2) collected nine points over those 4+ minutes to gain control of the outcome. An offensive putback by Sam Johnson started things. 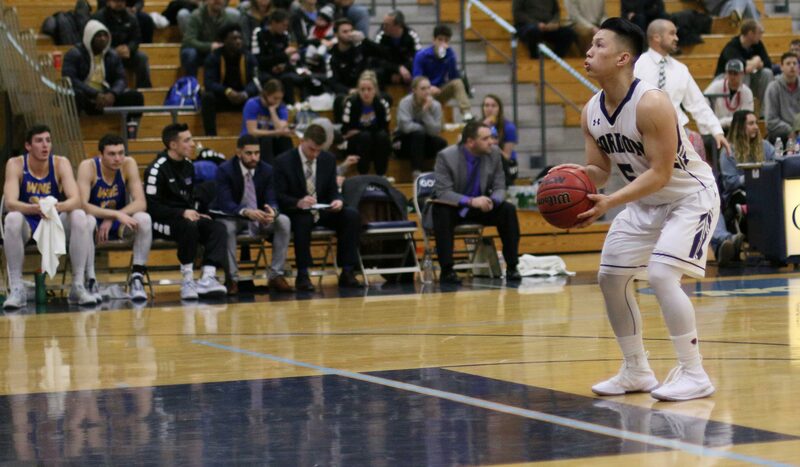 Then it was Jaren Yang from long range and finally two free throws and a layup by freshman Garrisson Duvivier. 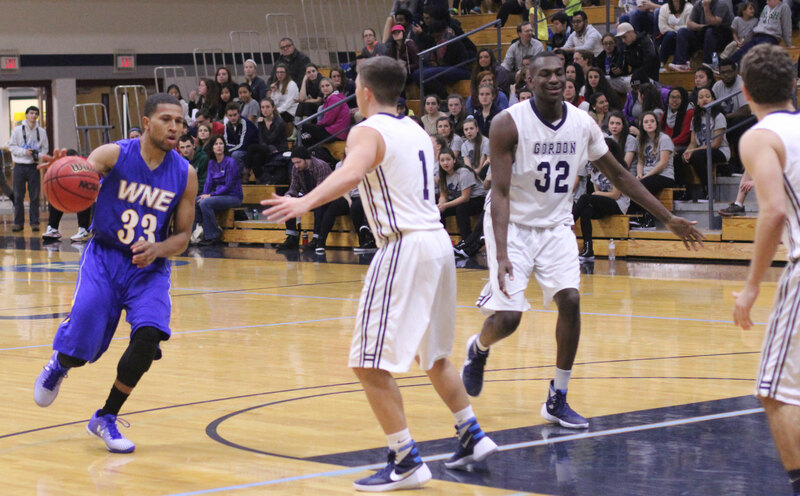 The sequence of almost unanswered offense put GC in front (68-58) for good. Both Garrisson and Sam registered double/double’s for Gordon. Garrisson now has two straight DD’s while, for Sam, it was his 3rd of the season. 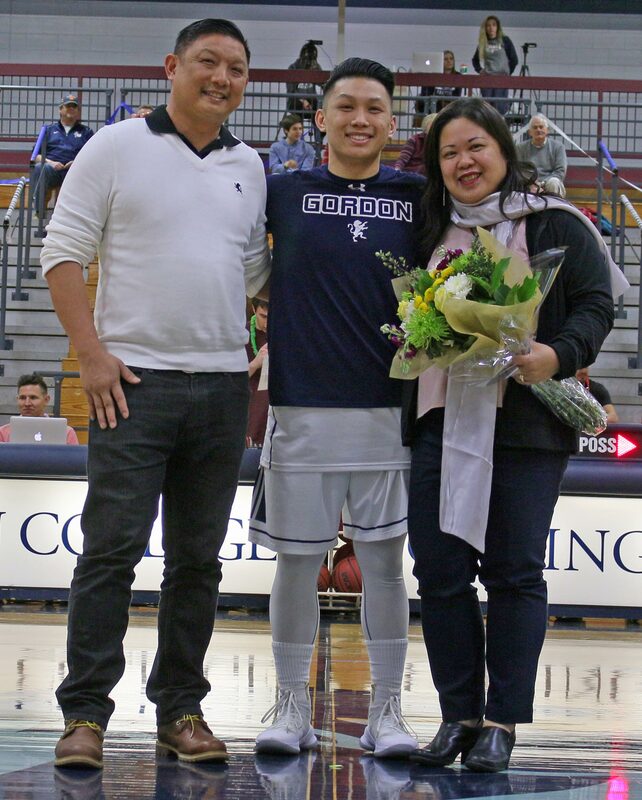 If the Efficiency Stat is any kind of a gauge, and I believe it is excellent, then Jaren Yang had his best game in a GC uniform. The young man from the Left Coast came out at 19 getting seventeen points and having only two missed shots from the floor. Better shot selection has been the key, in my opinion, to Jaren’s strong start in the 2015-16 season. Sam Johnson led all rebounders with thirteen. During that deadly dry spell the Golden Bears missed four layups, a jump shot, a three, and a free throw. That’s cold! 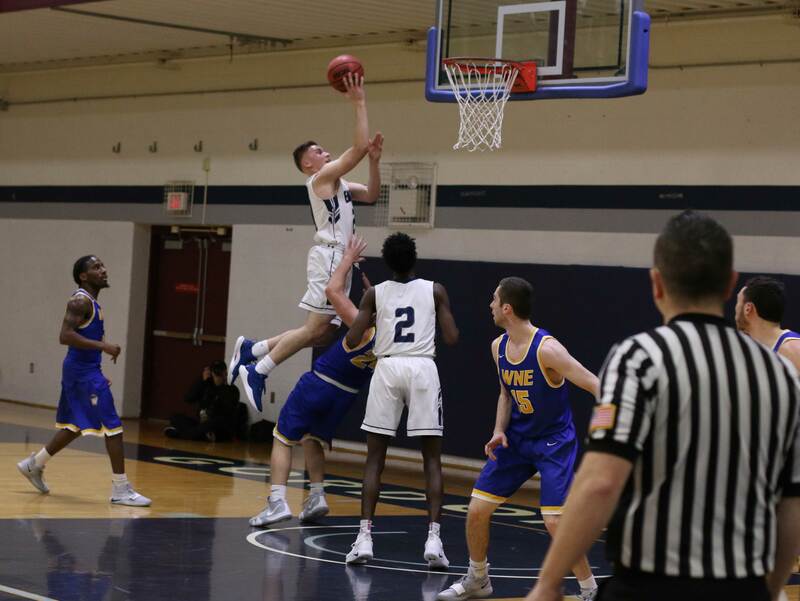 Eric Demers recovered from his 6-for-25 cold spell on the road, over the past two games, and was a warm 7-for-14 at the Bennett Center tonight. The talented freshman also had four assists. Season high in turnovers for Gordon (21). Some were on extra passes while some others were on unsuccessful attempts at highlight-reel passes. I’m a big fan of assisted baskets. GC had thirteen of them in this game. Good to see Richie Armand in uniform. 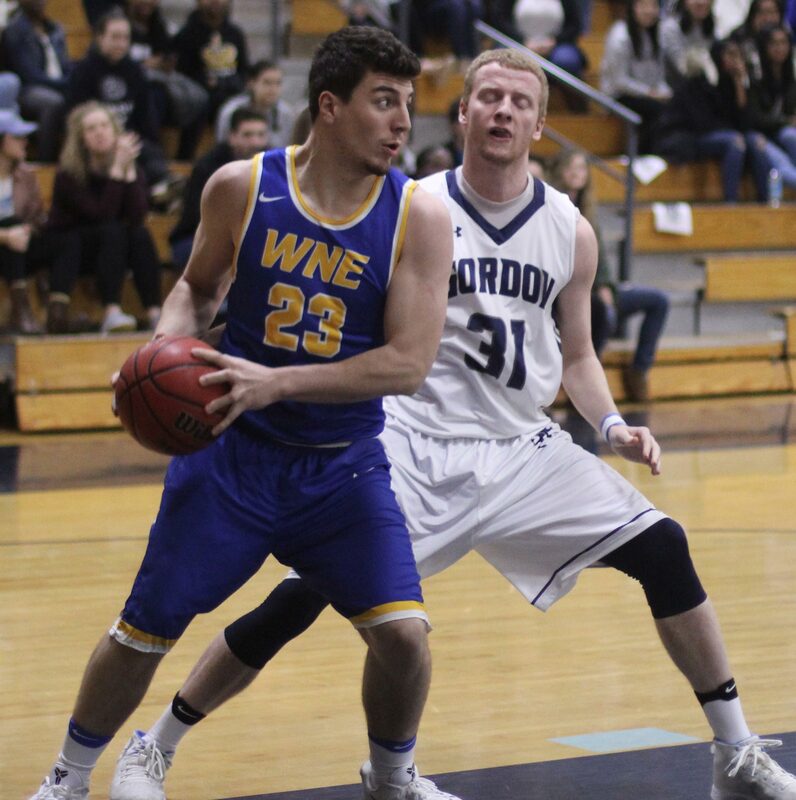 Last time Gordon faced Western New England, Richie hit a three (his only shot of the game) with five seconds left to defeat the Golden Bears by two. Word was that Richie was the fifth option for that final shot but found an open look and drained a game-winner. The rest of December Gordon will play on the road. They start that 4-game slate with a visit to CCC opponent Roger Williams on Saturday afternoon. Can GC get its first road win in Bristol?